Chocolate ! Chocolate! We are going to Denver’s Museum of Nature and Science to learn about chocolate. 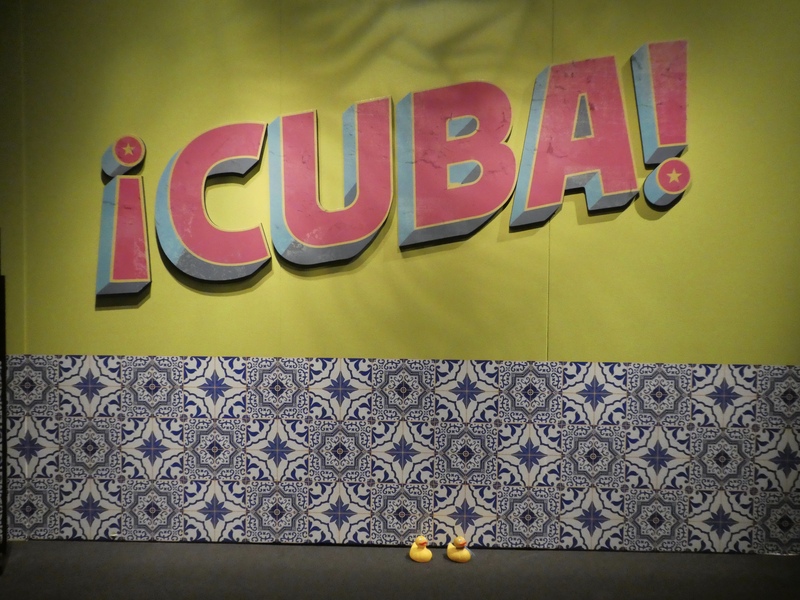 I, Zeb the Duck am ready. Let’s go mom. 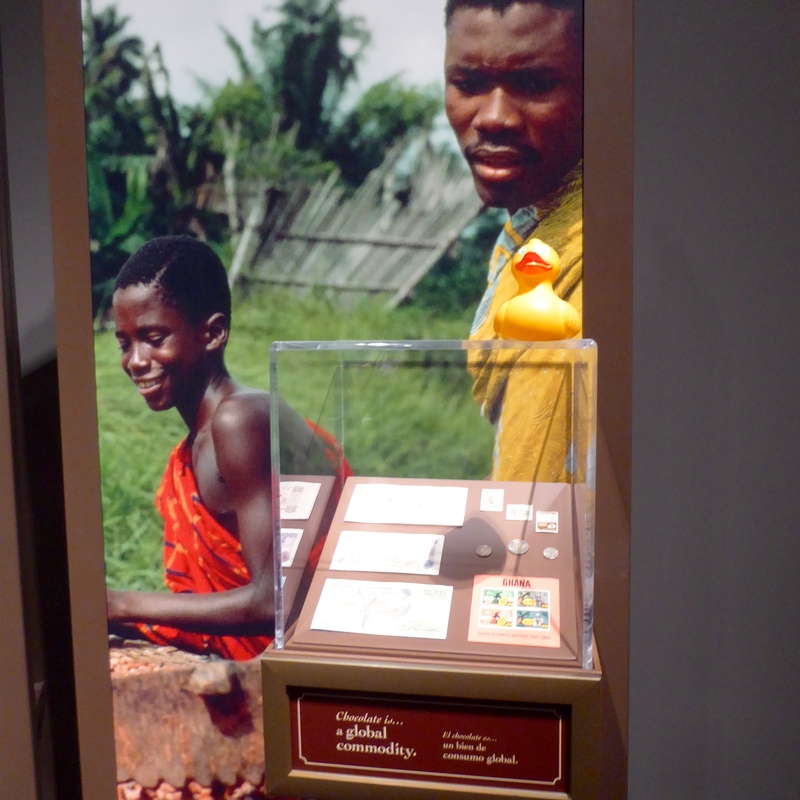 We enter the exhibit, which is included with a general admission ticket or our museum membership card. Chocolate comes from a tree. The seedpods of the cacao tree. Those are pretty big seedpods. Chocolate comes from the 30-50 seeds in each pod. One pods provides enough chocolate for about 7 milk chocolate bars. Animals eat the pulp while the tough husk protects the seeds. 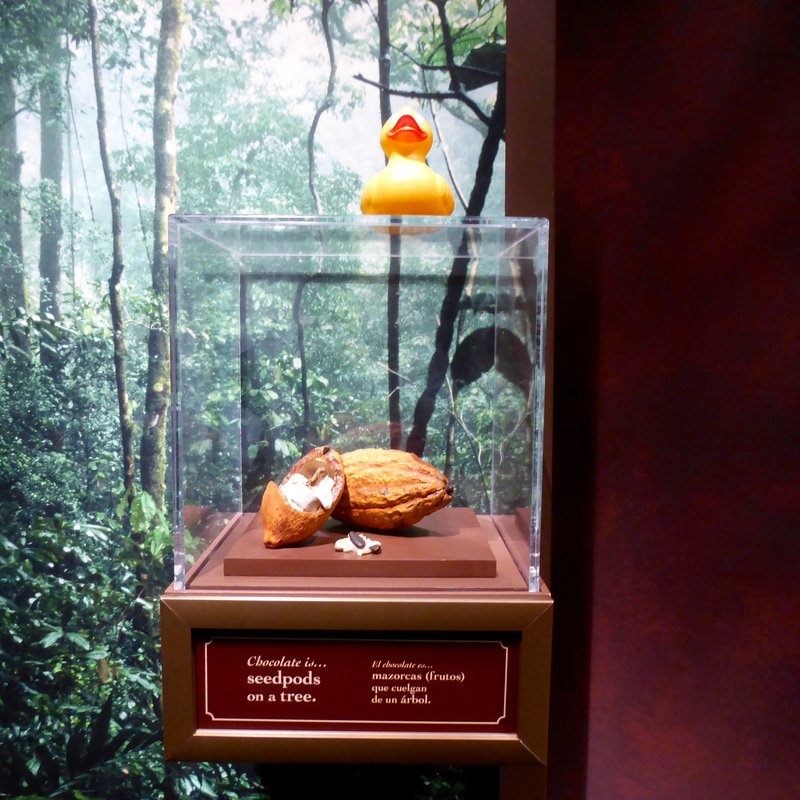 Animals help create new cacao trees. They eat the sweeter pulp, while throwing the seeds on the ground. Many seeds will create new trees. 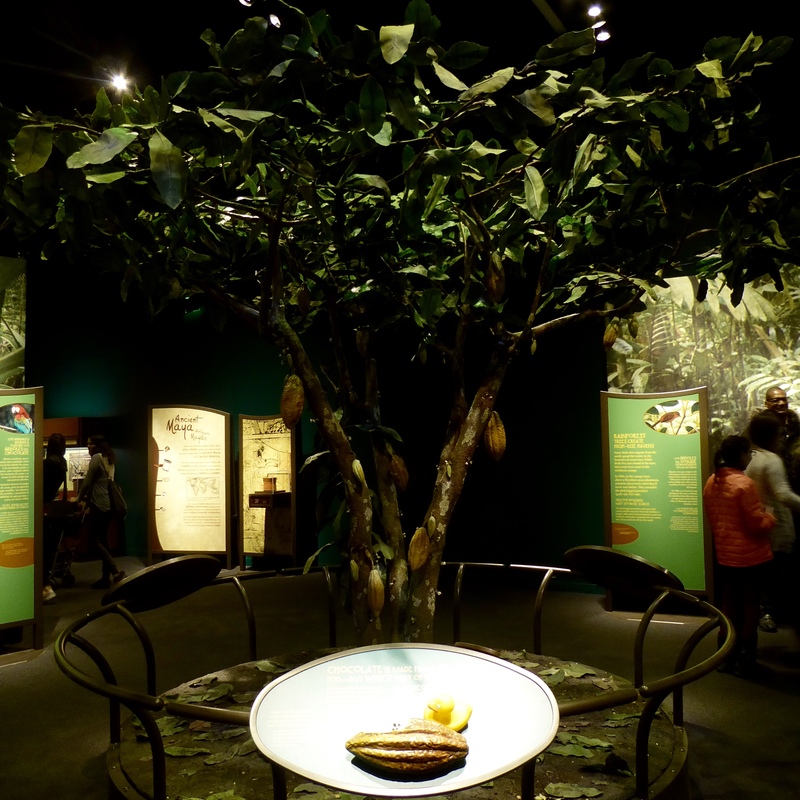 The Mayans loved the chocolate and often grew cacao trees near their homes. It was easy to go in their yards to get chocolate seeds. 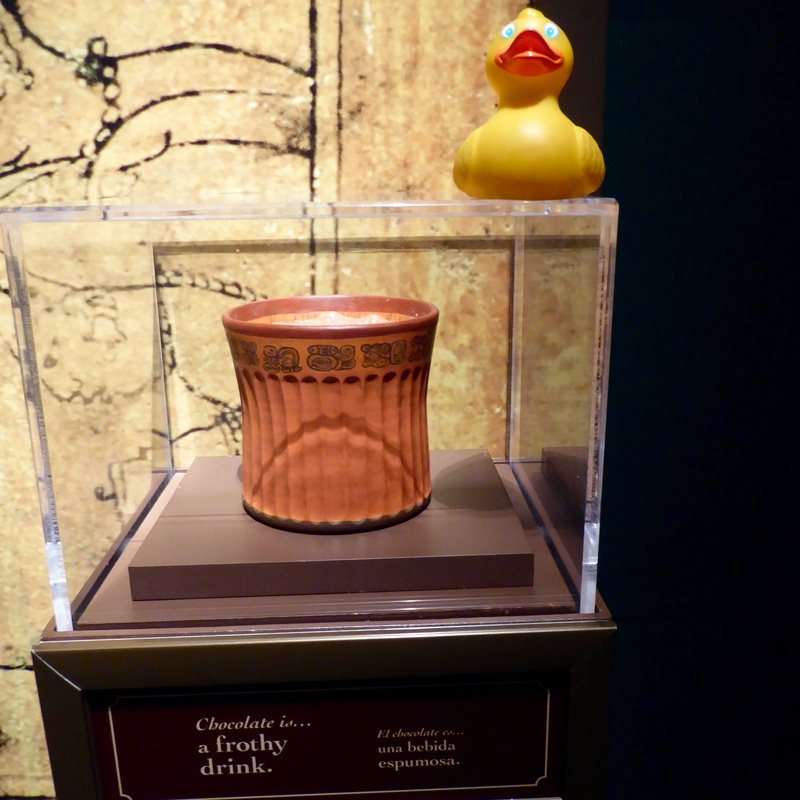 The Mayans enjoyed chocolate as a frothy drink. 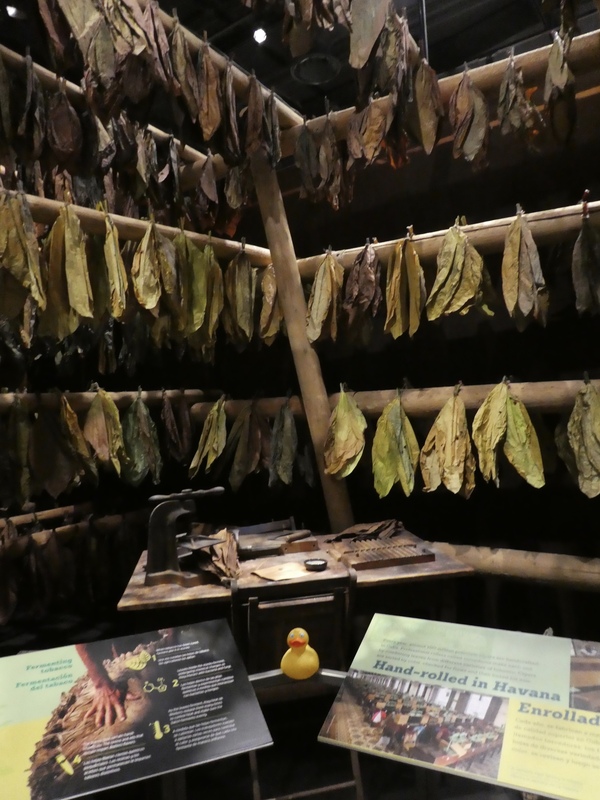 The cacao seeds were fermented, dried and roasted. These seeds were then crushed into paste and mixed with water. 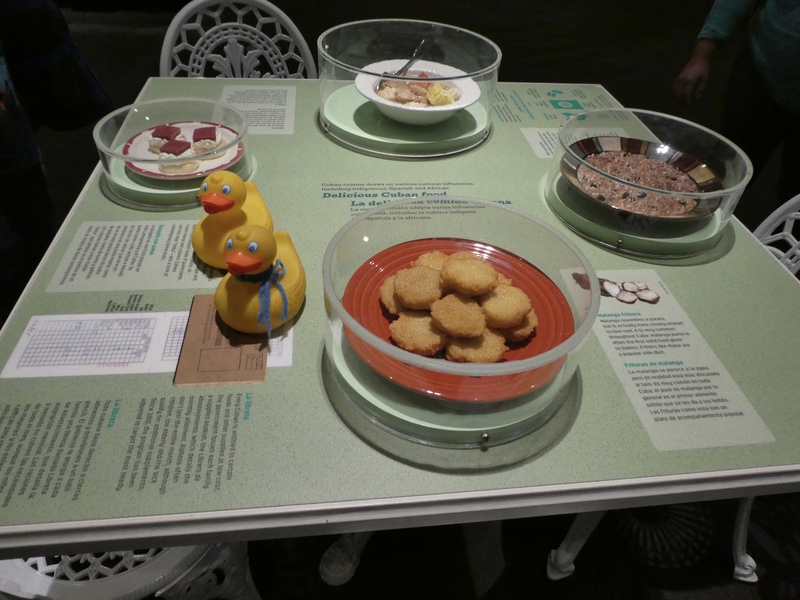 Other ingredients such as cornmeal, honey, and chili peppers were added. The beverage was then poured back and forth between two cups to make the beverage frothy. 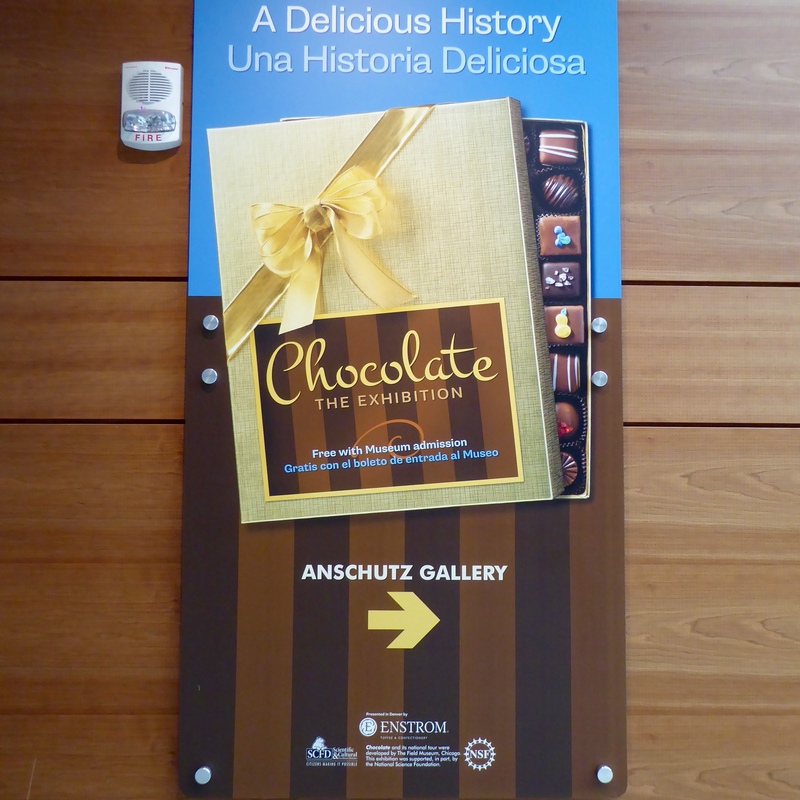 Enjoyed by rich and poor, chocolate was a particular favorite of Maya Kings and priests. 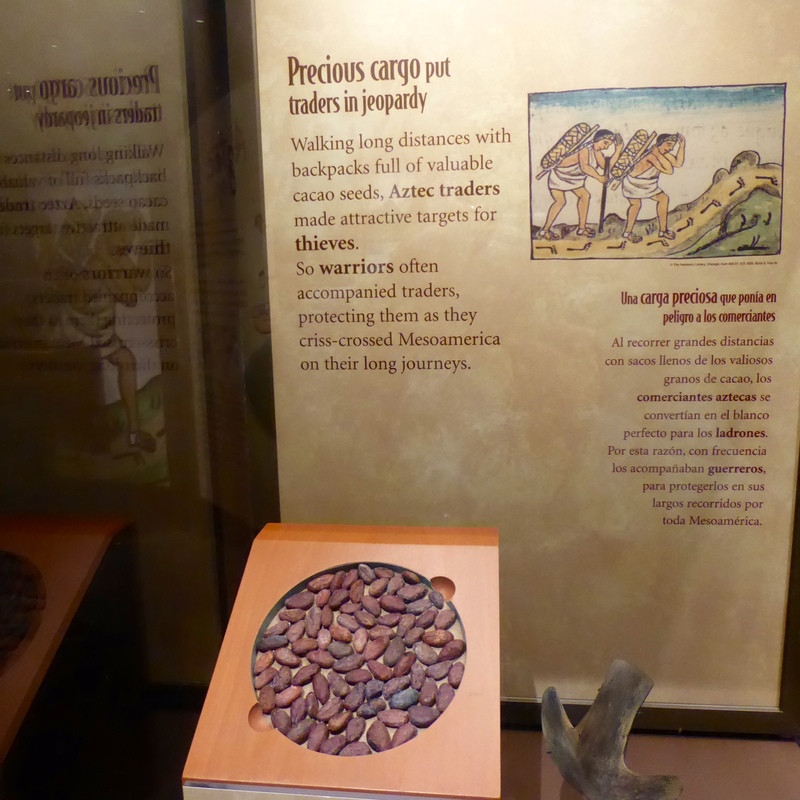 Chocolate was widely traded and was used as money by Aztecs. 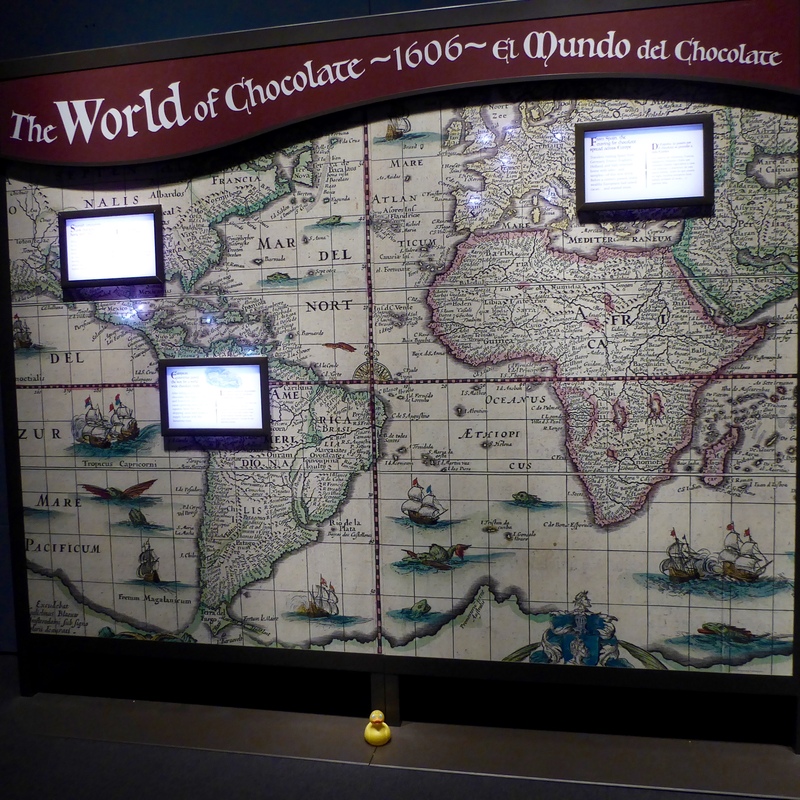 In 1606, this was the World of Chocolate. 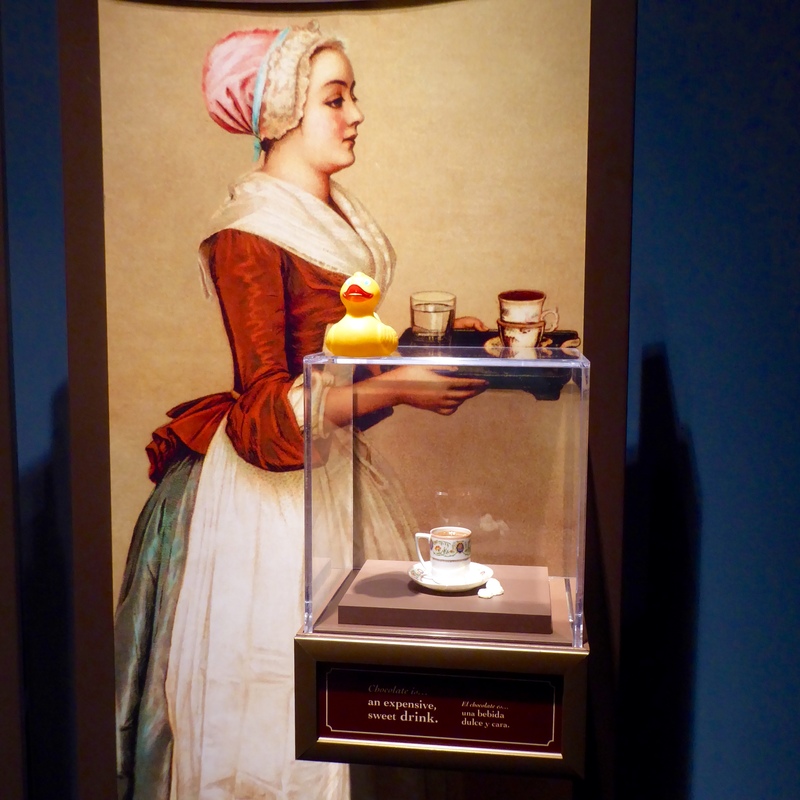 Chocolate was introduced to Europe where sugar was added to the beverage. 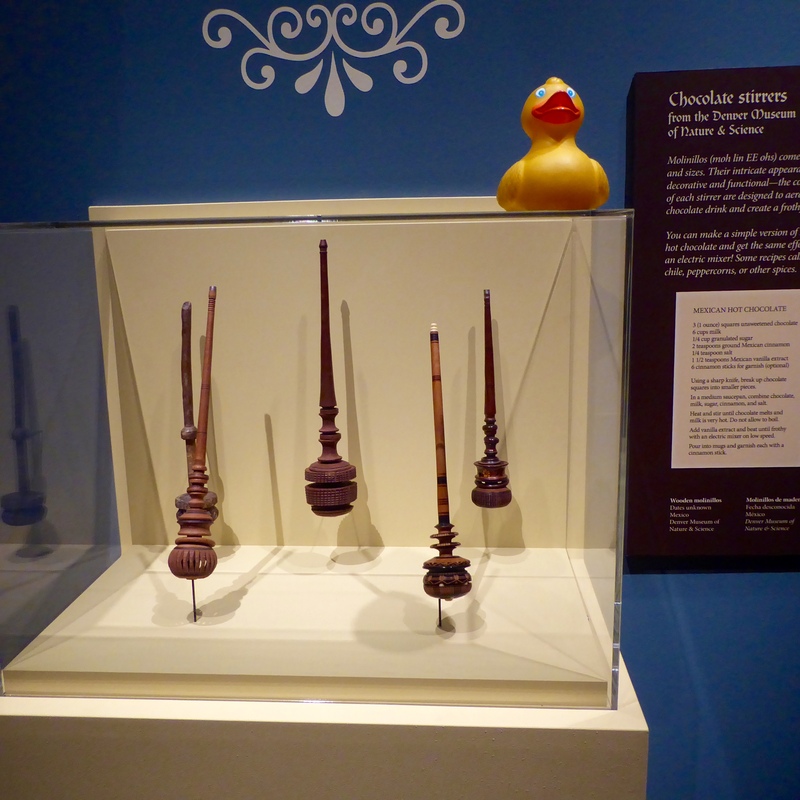 Europeans also invented the chocolate stirrer, to more easily create froth on top of the beverage. 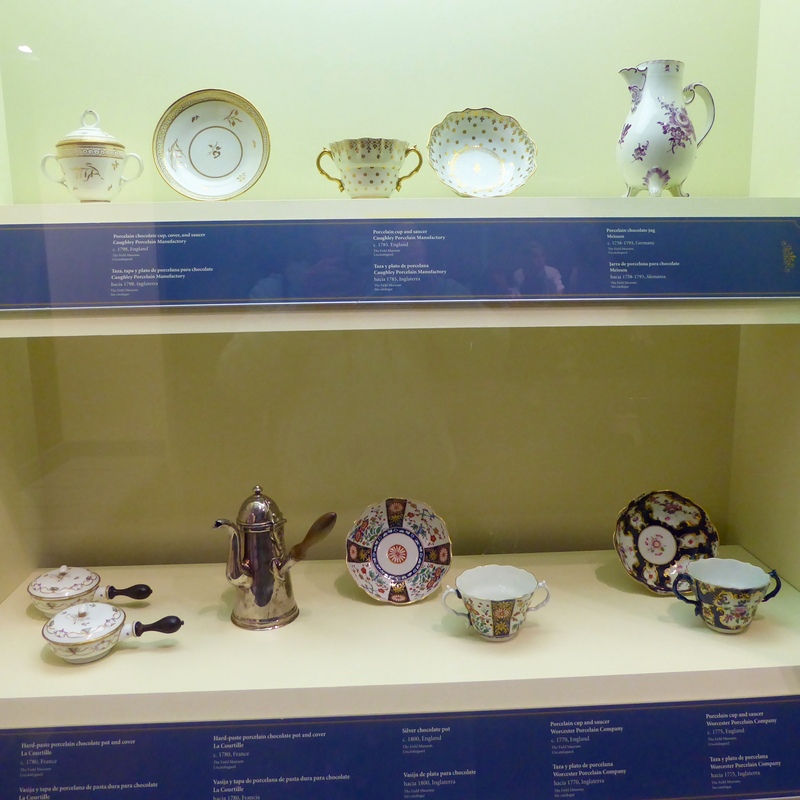 Having and serving chocolate soon became a status symbol for the wealthy, requiring special serving cups and utensils. In 1847 the first chocolate bar was made. 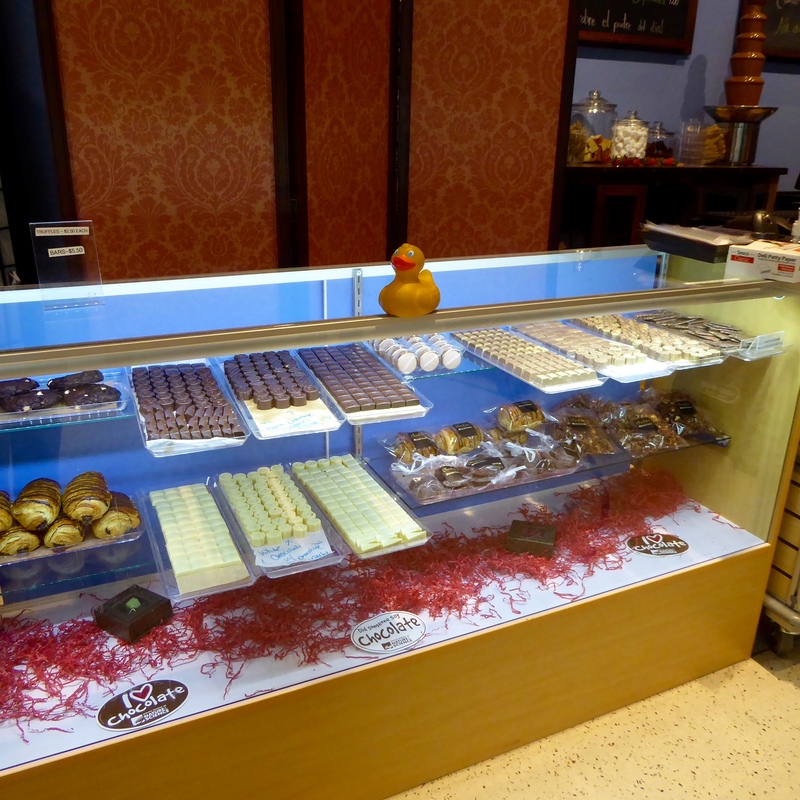 The chocolate bar led to a new chocolate item–molded chocolate. 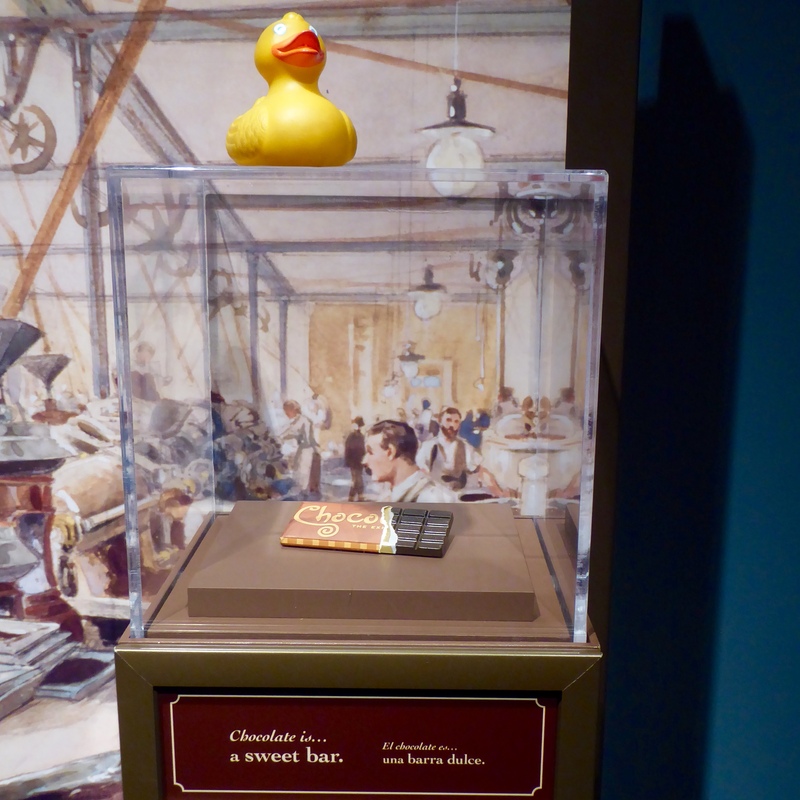 Later, in 1875, chocolate maker Daniel Peter teamed with Henri Nestle to produce milk chocolate. Soon chocolate symbolized romance. 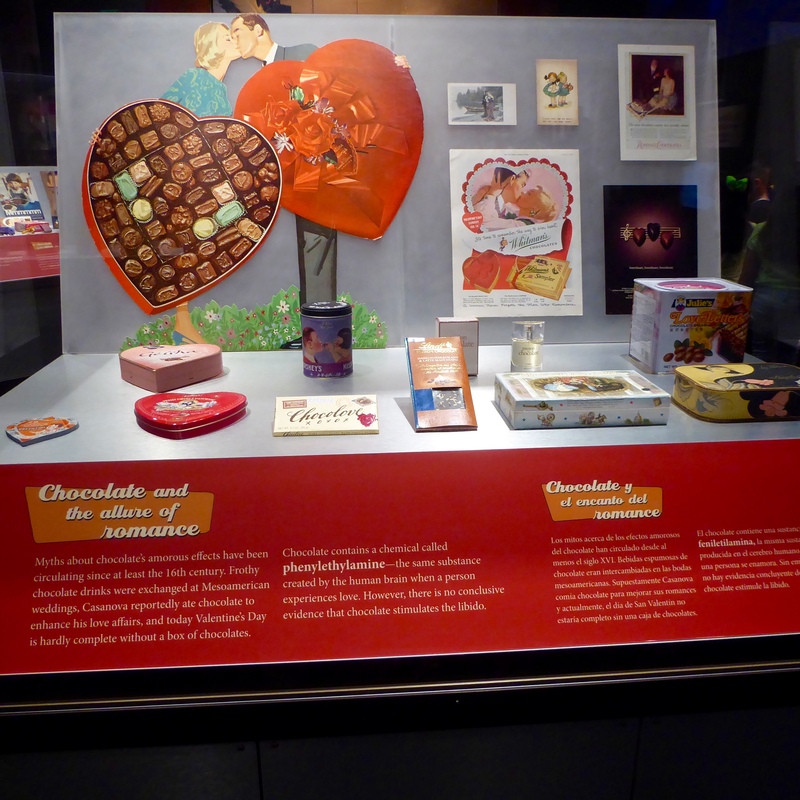 Today chocolate is a global commodity, with much coming from Africa. Near the exit, and entrance, to this exhibit we enjoyed the Chocolate Shop. 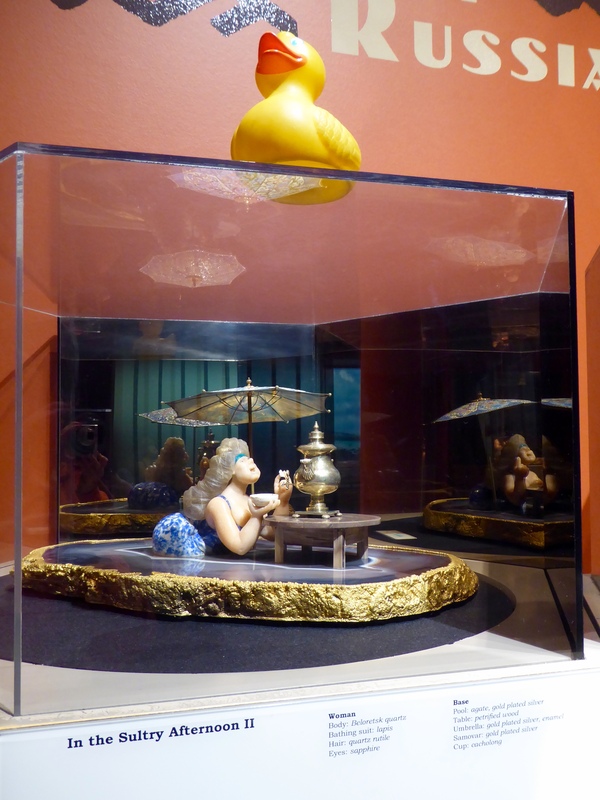 Enstrom’s Candies from Colorado is a sponsor of this exhibit. We loved this case. I can only have one??? Mom said I had to pick just one. 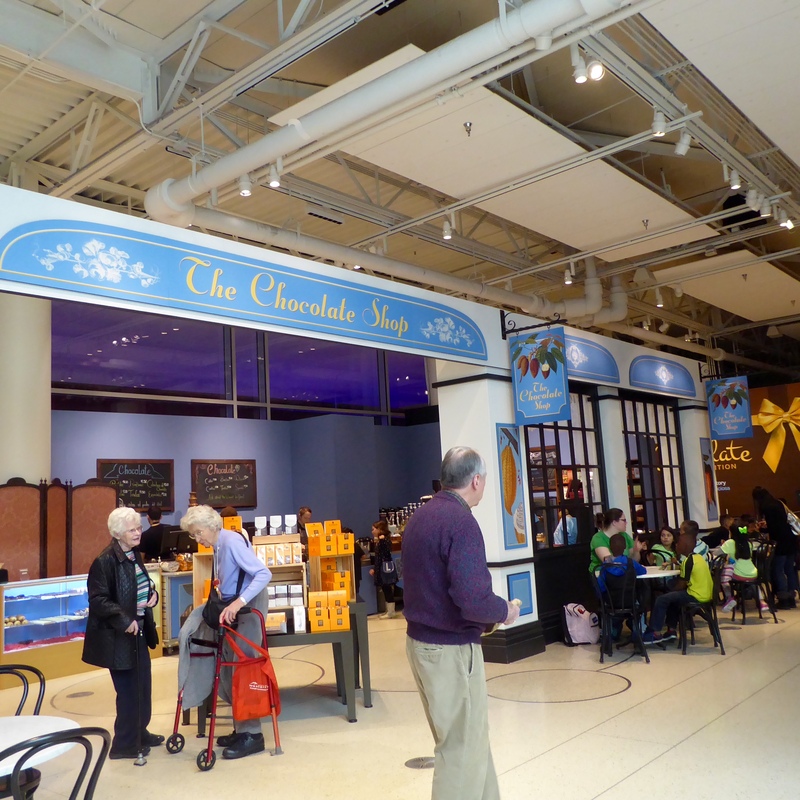 Don’t wait too long to visit Chocolate at the Denver Museum of Nature and Science. 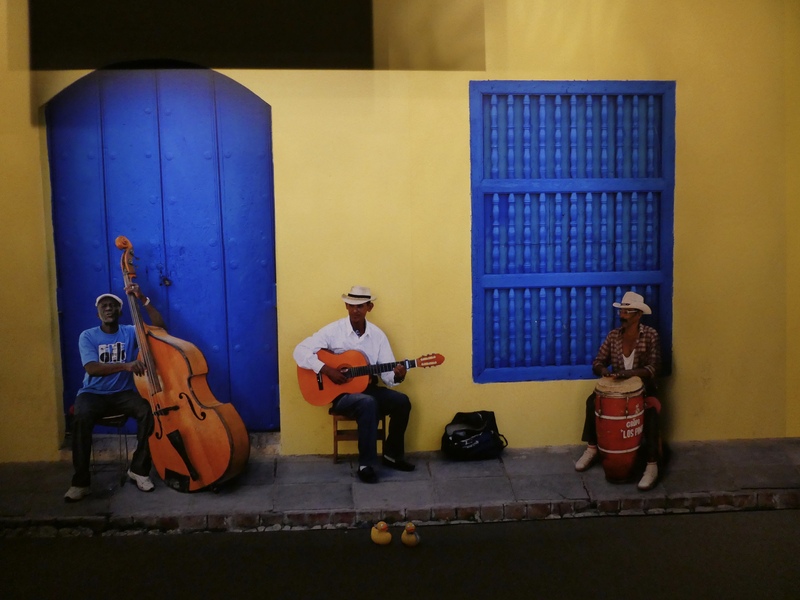 The exhibit is here only until May 8, 2016. 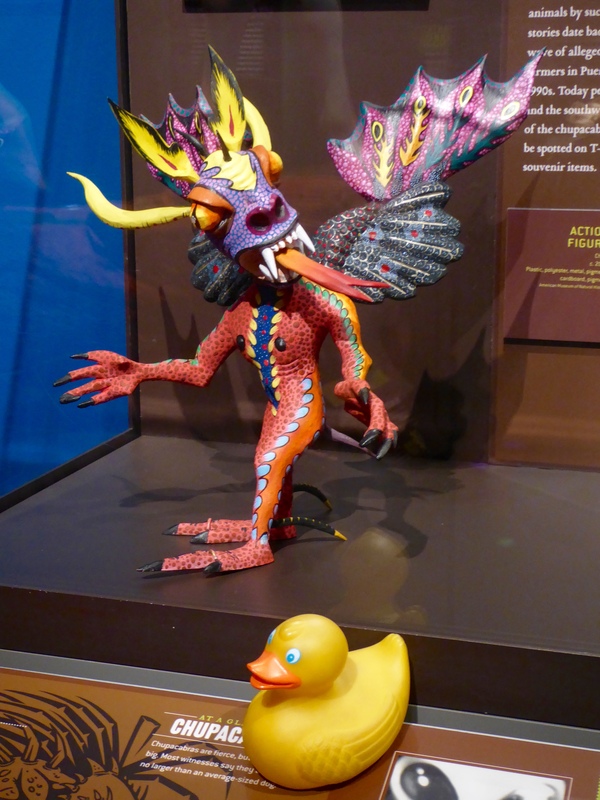 I, Zeb the Duck, saw Mythic Creatures at Denver’s Museum of Nature and Science. 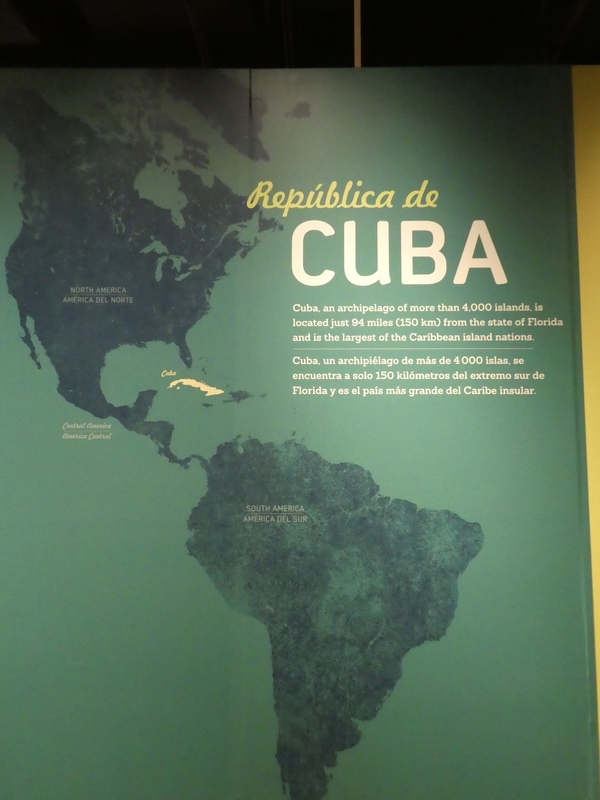 This is a special exhibit through September 7, 2015. It is good; don’t miss this one. This is the Kraken. Hundreds of years ago, European sailors told of a sea monster called a kraken that could toss ships into the air with its many long arms. 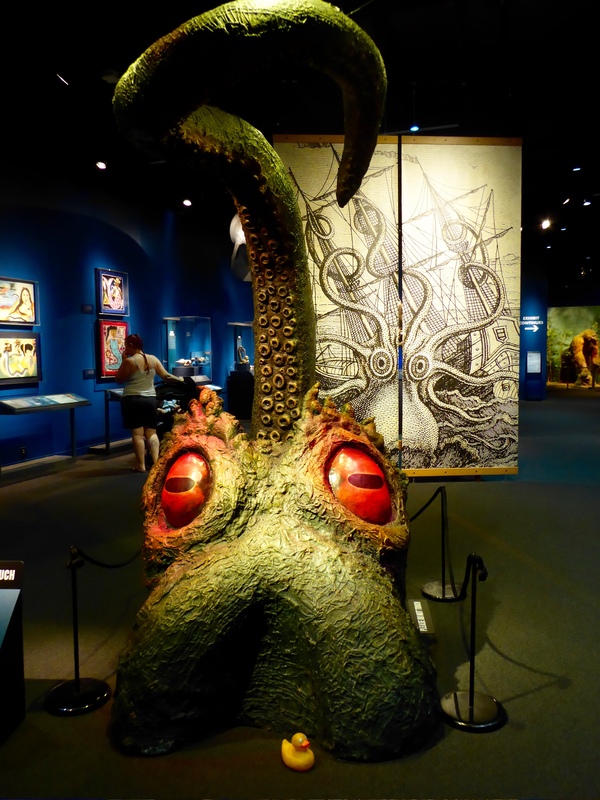 Today we know of a living sea animal, the giant squid, that has eight arms and two tentacles. It can grow longer than a school bus, but it lives at great depths and is hardly ever seen. 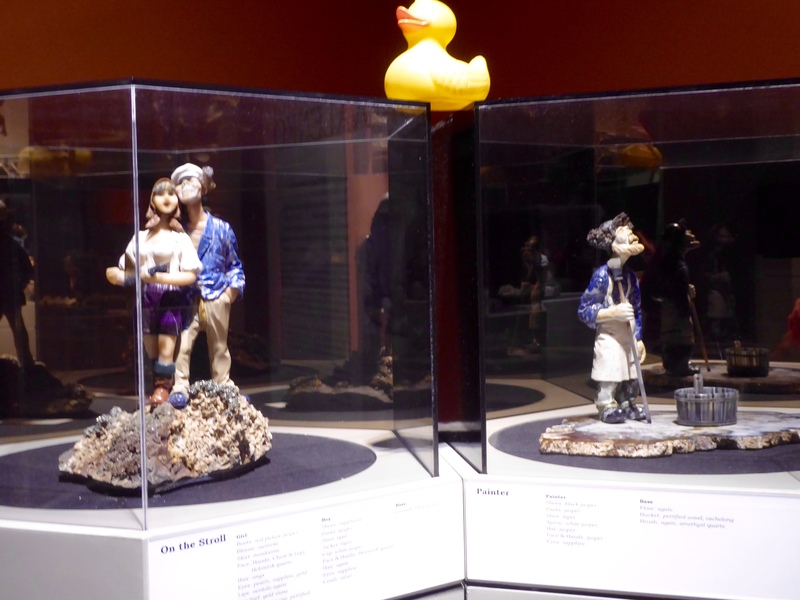 I, Zeb the Duck, may be in love with this mermaid. 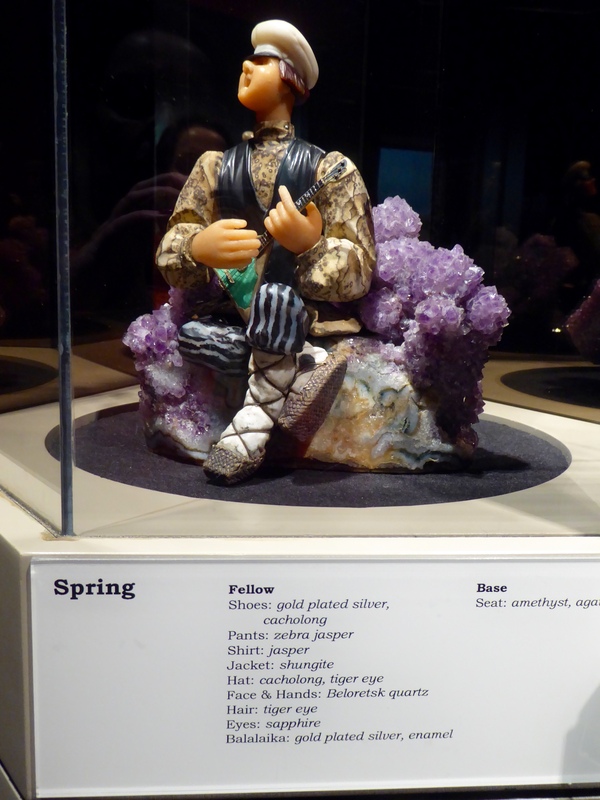 This s a Yawkyawk made from fiber, by Marina Murdilnga. 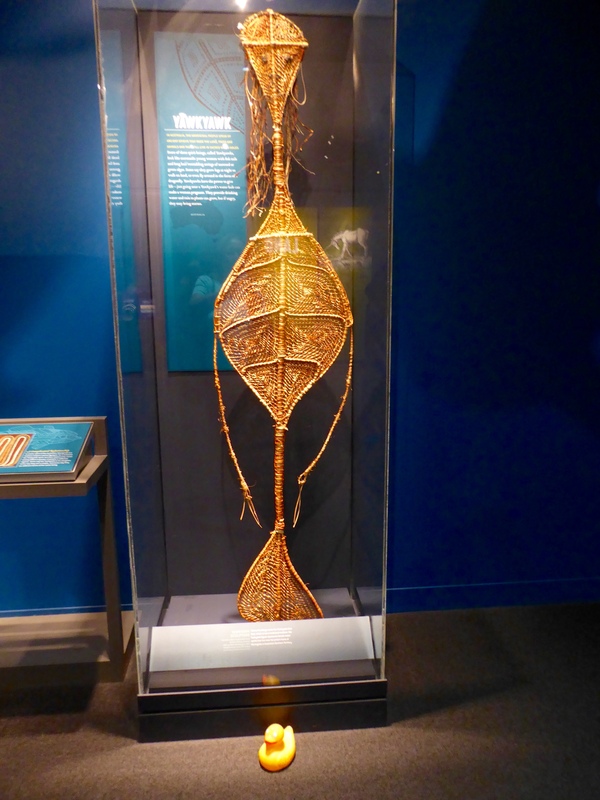 This is an ancient spirit of northern Australia’s aboriginal people. 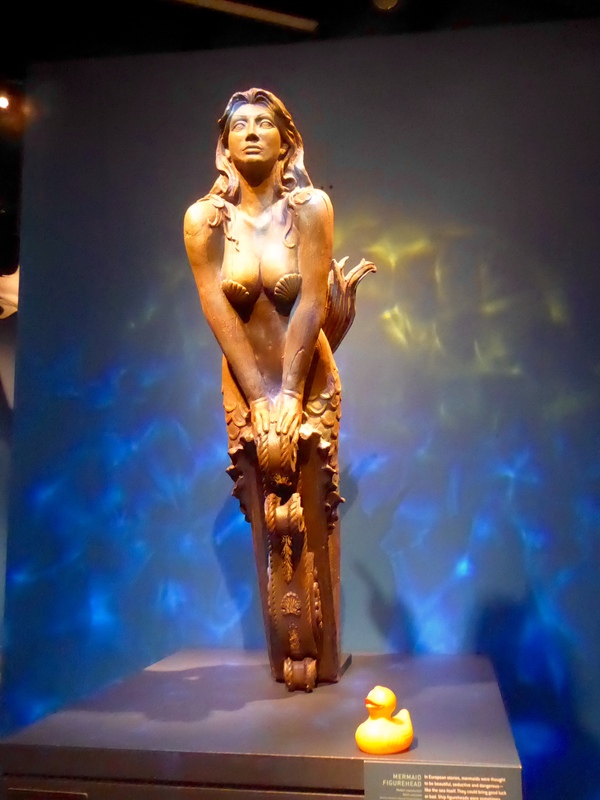 This spirit that lives in the water, looks similar to a mermaid and has the power to give life. Some believe a woman can become pregnant just by going near their water home. 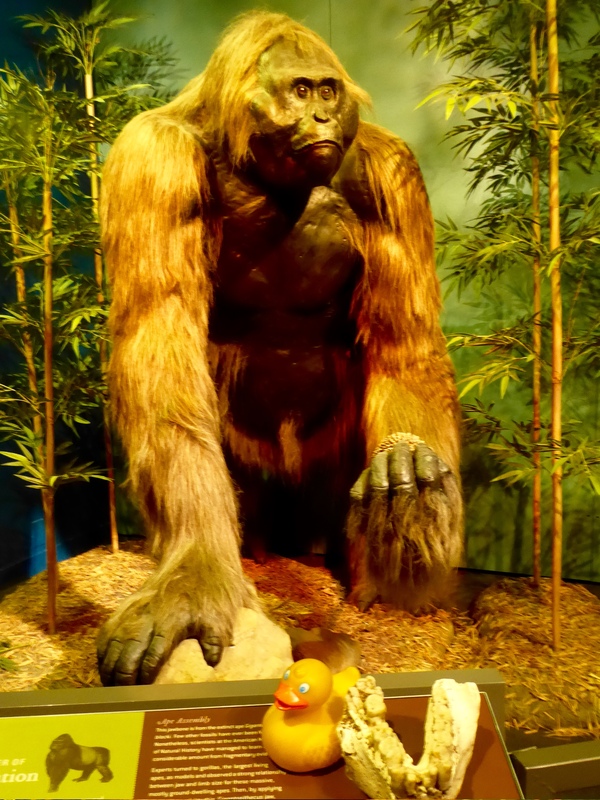 This giant Optithecus blacki, lived in southeast Asia for almost a million years, until about 300,000 years ago. In China fossilized teeth and jaws have been found. I am sitting by a fossilized jaw bone. 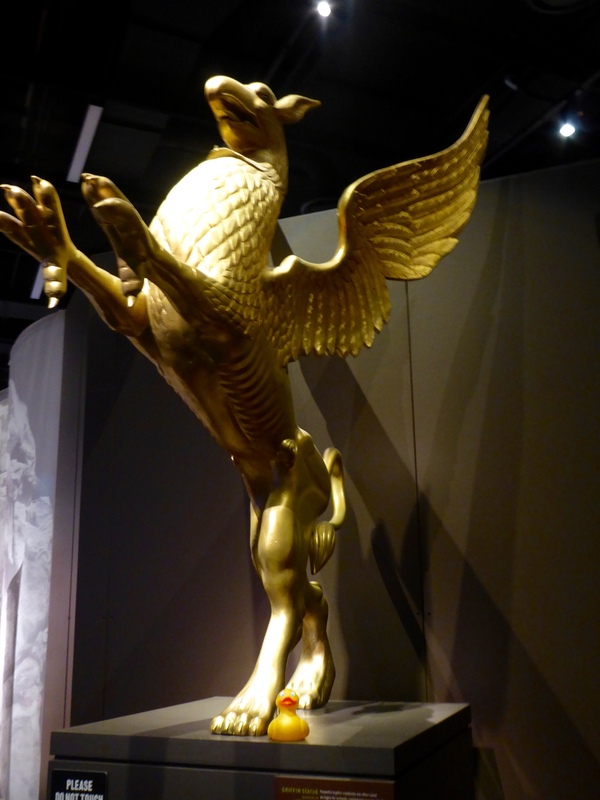 This is a statue of a Griffin. A griffin is a legendary creature with the body, tail and back legs of a lion. A griffin has the head and wings of an eagle and has eagle’s talons on the front feet. 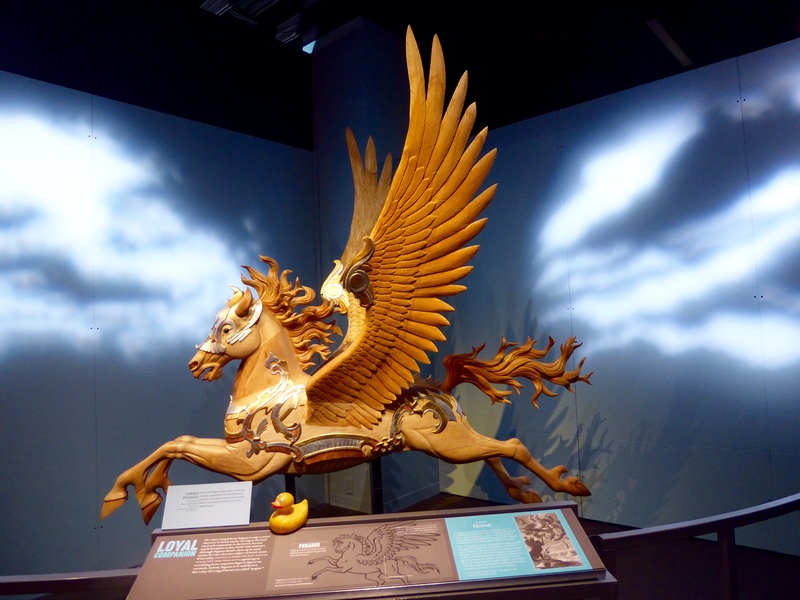 The Griffin was thought to be an especially majestic creature. I liked this unicorn. 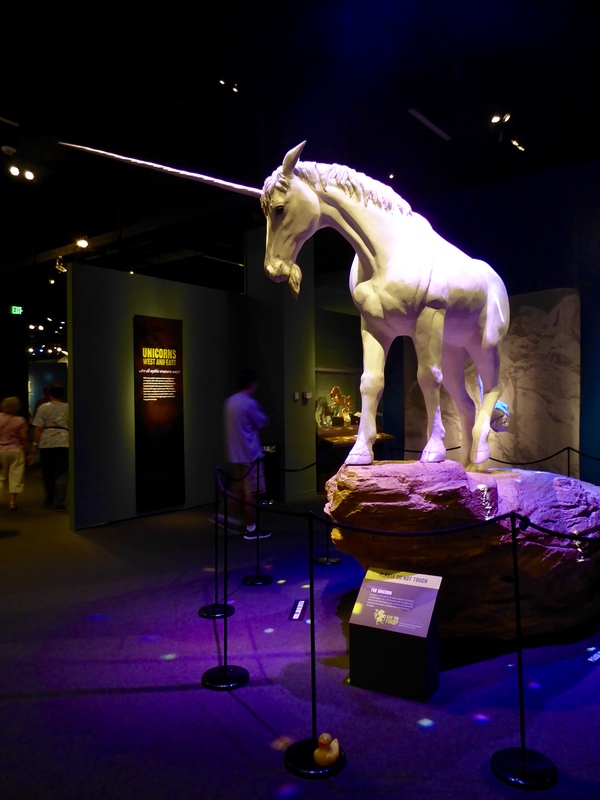 In modern fairy tales and stories, the mythic unicorn looks like a white horse with a single long horn on its head. But in older stories, this fantastic creature has a short, colored horn and the body of a goat. 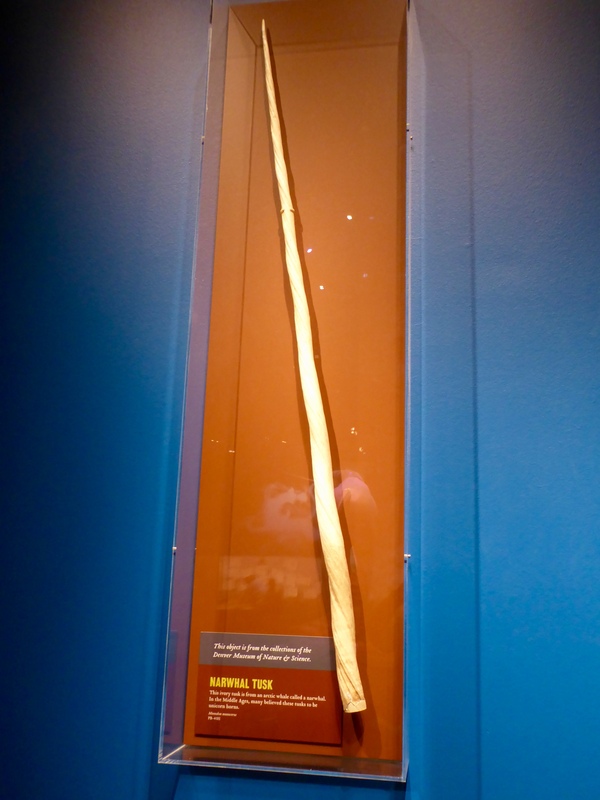 This is an ivory tusk from an arctic whale called a narwhal. In the Middle Ages, many believed these tusks to be unicorn horns. This chupacabra from Mexico lurks in the forest prying on goats and cattle, terrifying local residents. The chupacabra acts much like a vampire, killing animals by sucking their blood. 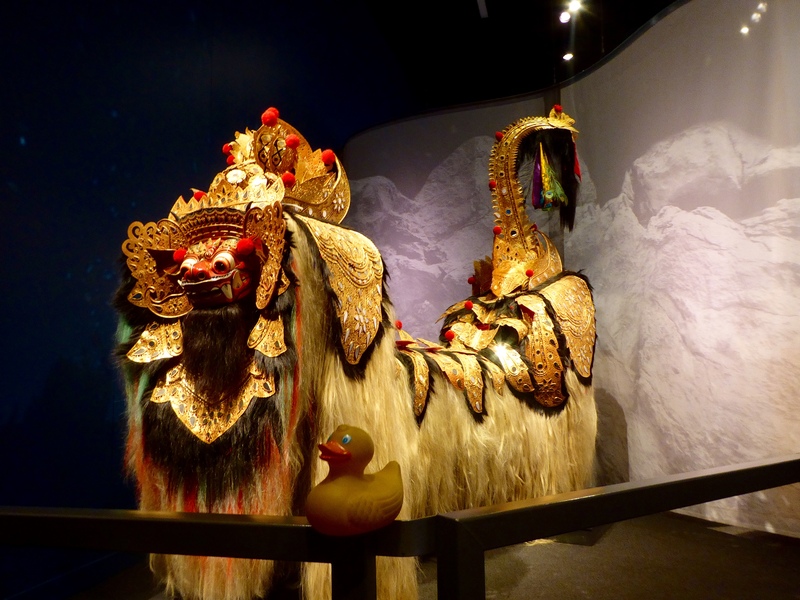 The Barong Ket is King of the Spirits and an oversized village guardian for many residents of the island of Bali, Indonesia. Rangda is the half-goddess, half witch demon queen of Bali who often battles Barong. Elephant Bird is from Madagascar. This bird, according to fossils, did exist on the island of Madagascar. However, even though legend says the bird could pick up elephants, he would not have been able to lift an elephant. 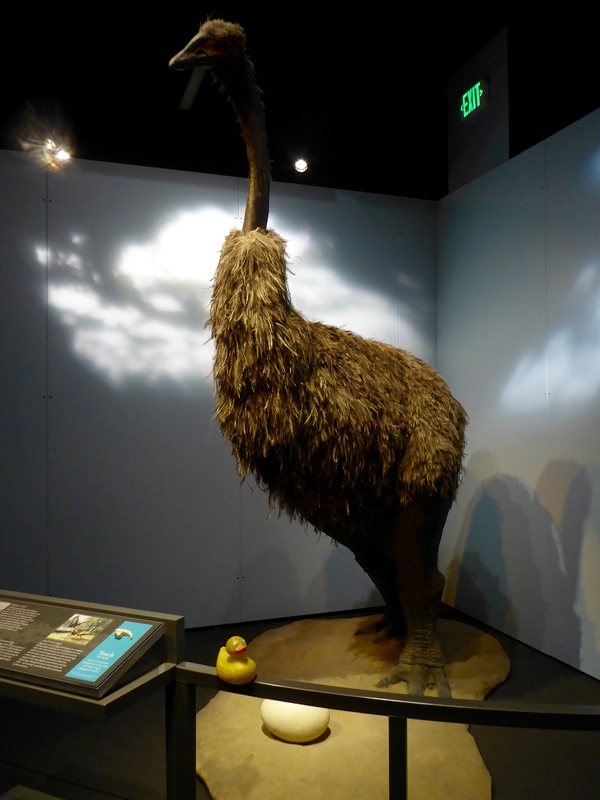 Another problem with the legend: Elephant bird lived in Madagascar, but elephants never lived in Madagascar. 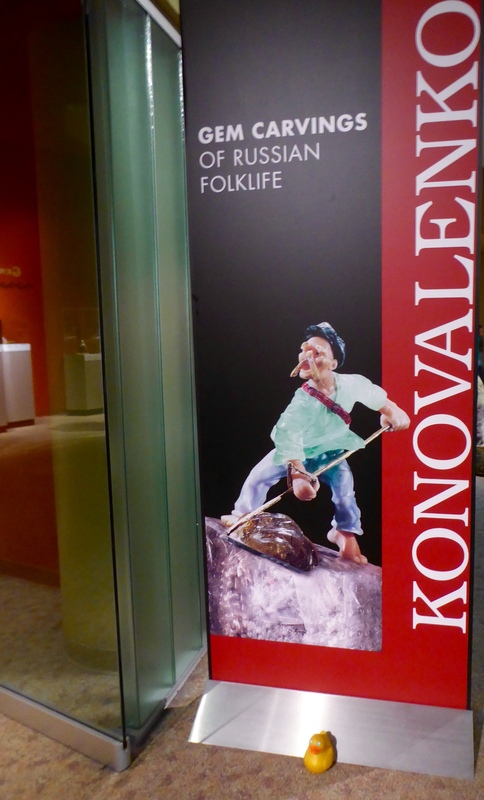 The fossilized egg, also found in Madagascar is the largest egg ever found. This is Pegasus, son of the monster Medusa and Poseidon, the god of the sea and of horses. 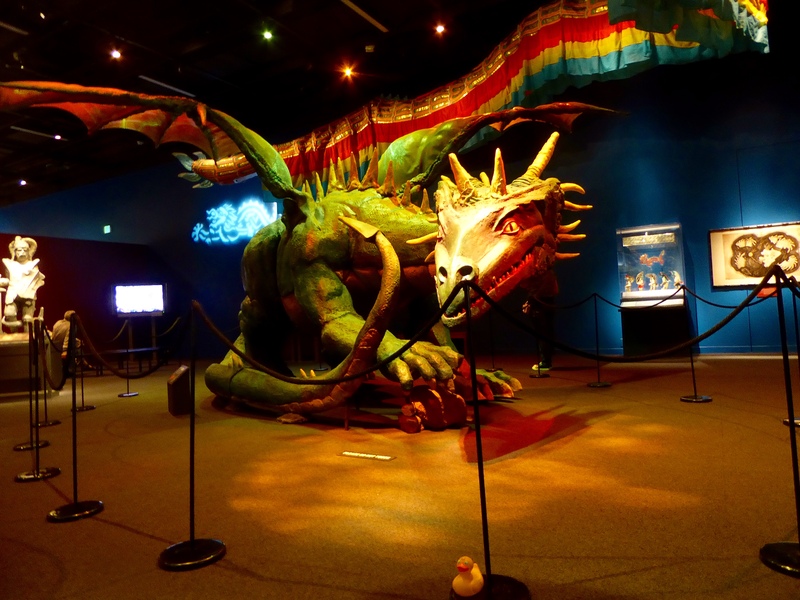 Of all the mythic creatures that rise from the water, prowl across land, or fly through the air, the dragon is the most famous. A very impressive dragon. 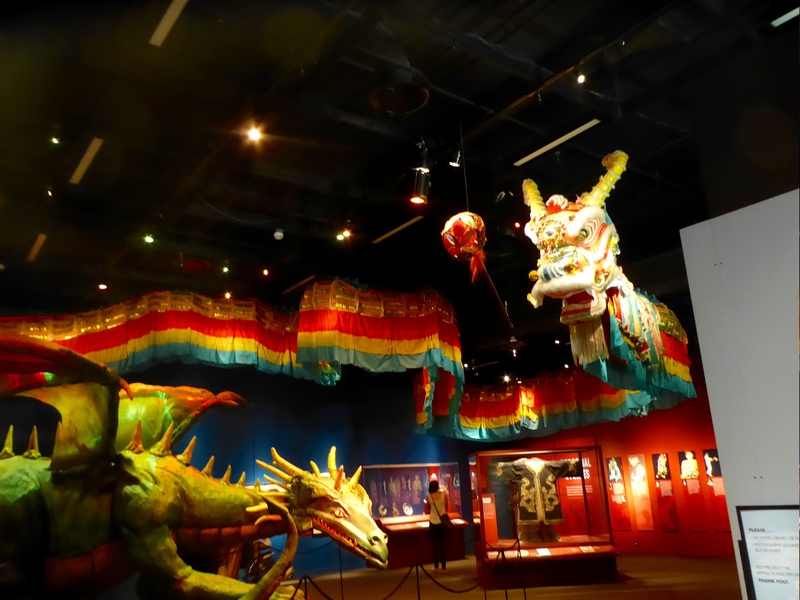 The Chinese Parade Dragon chases the “Pearl of Wisdom,” a baton carried by the parade leader. 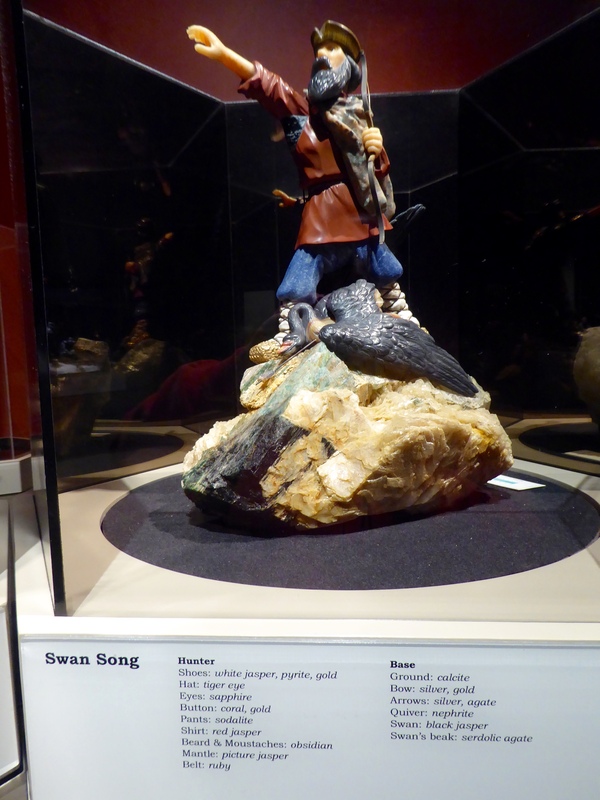 We have a great museum in Denver. 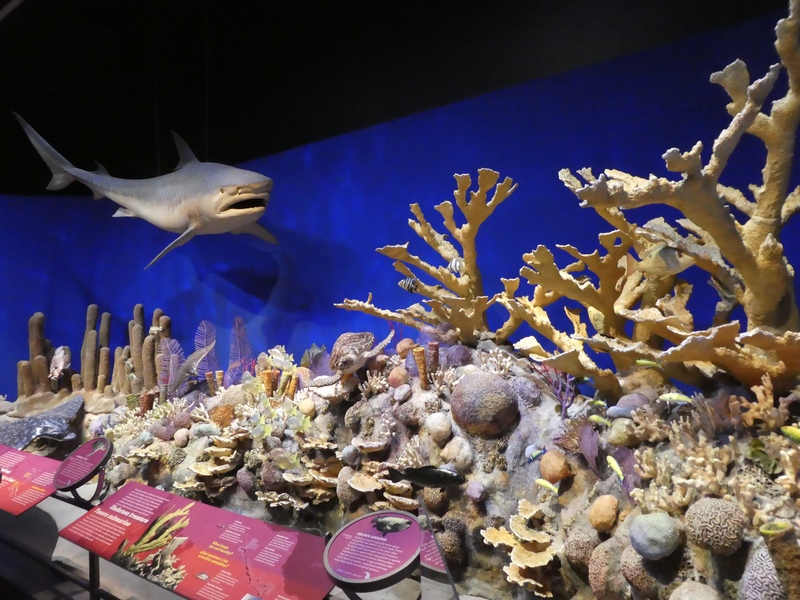 We visit the Denver Museum of Nature and Science often. 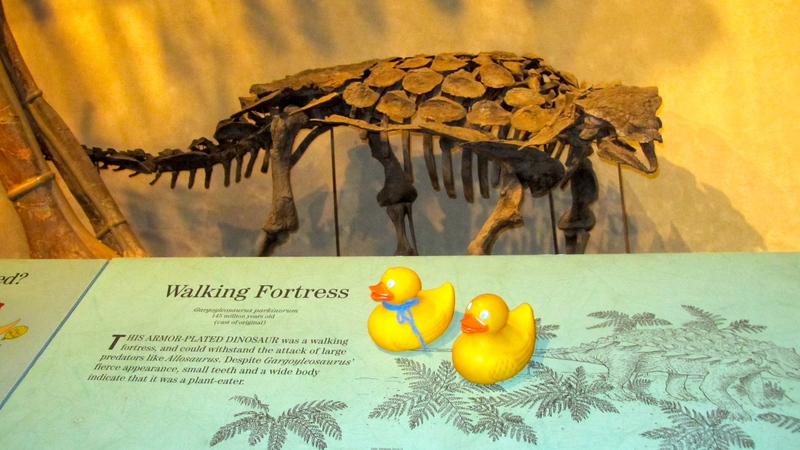 I, Zeb the Duck, and Soapy Smith Duck wanted to see dinosaurs. 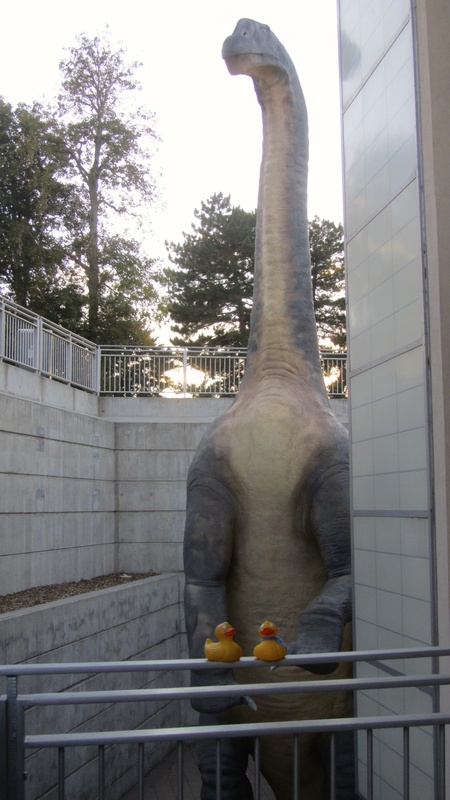 Before we even entered the museum, we saw dinosaurs by the parking garage. As we entered the museum, we were greeted by T-Rex. 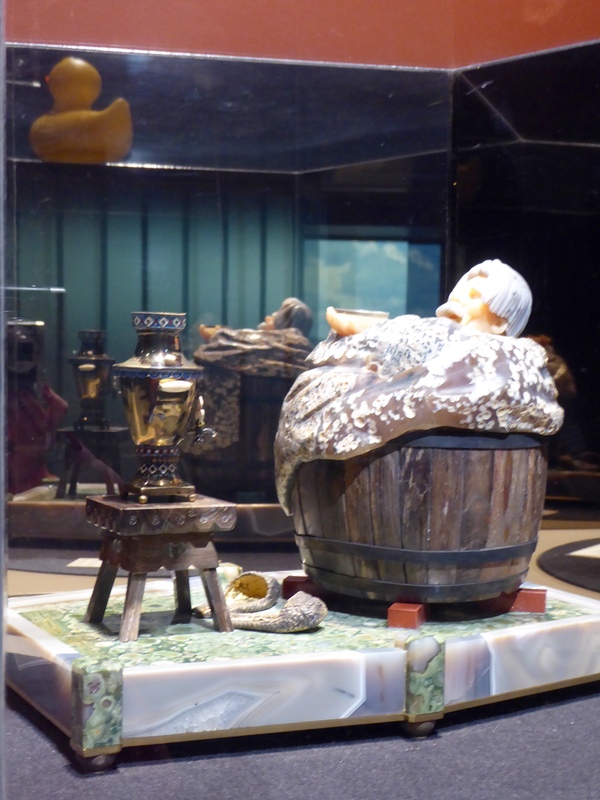 He weighed about 7 tons and could run 25 miles per hour. 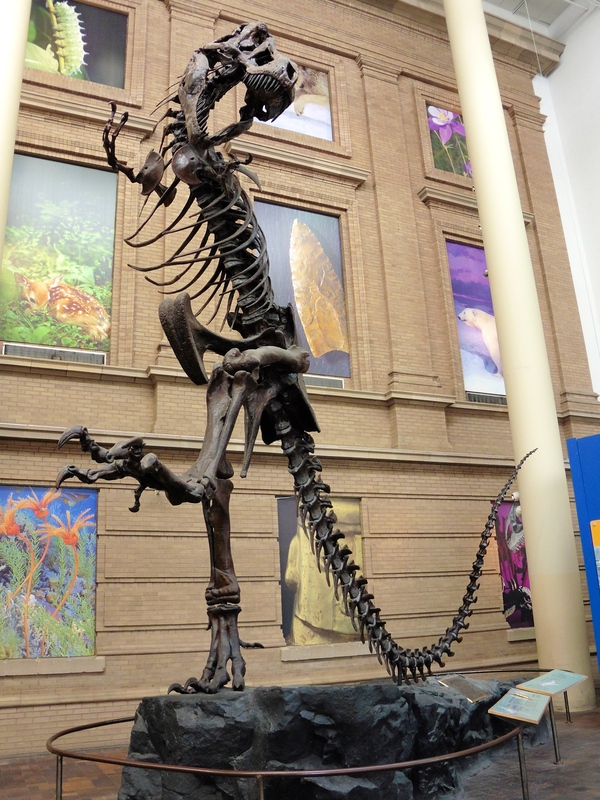 T-Rex had a long tail for balance as he walked on 2 legs. His small arms were for holding prey and to help him get up from a resting position. 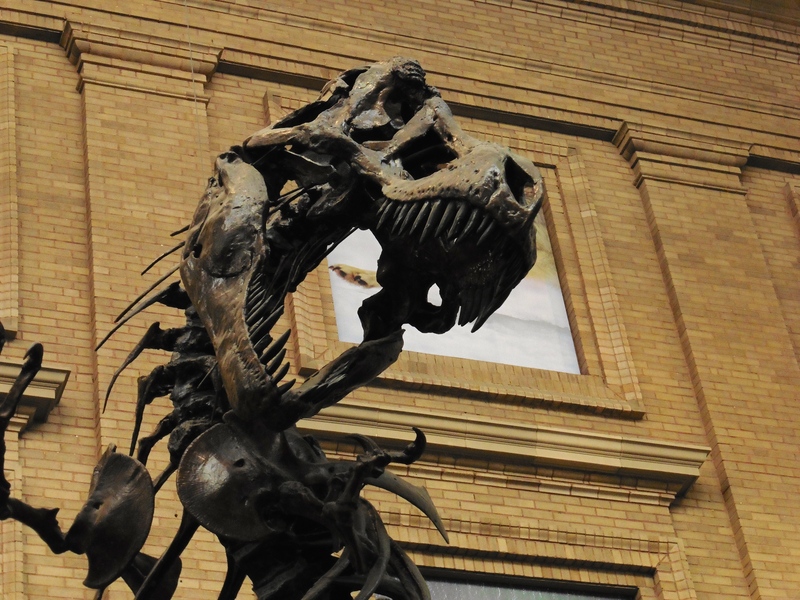 T-Rex had really powerful jaws and neck muscles. You would not get away from this guy. 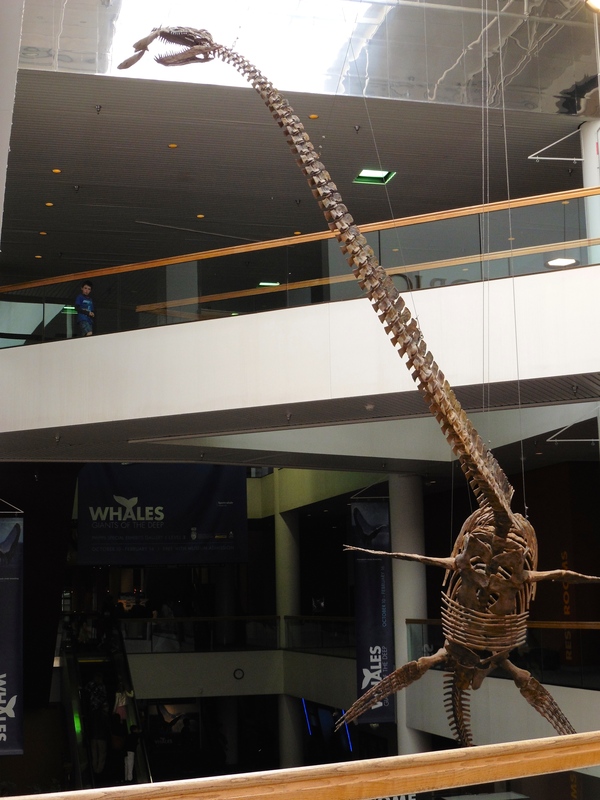 we saw plesiosaurs. He is called the ancient swimmer of the deep. We ducks do not want to swim with him. Entering Prehistoric Journey we saw dinosaurs everywhere. This skeleton is of walking fortress. You can see how he got that name. Walking Fortress has small teeth and a wide body so scientists believe he was a plant eater. 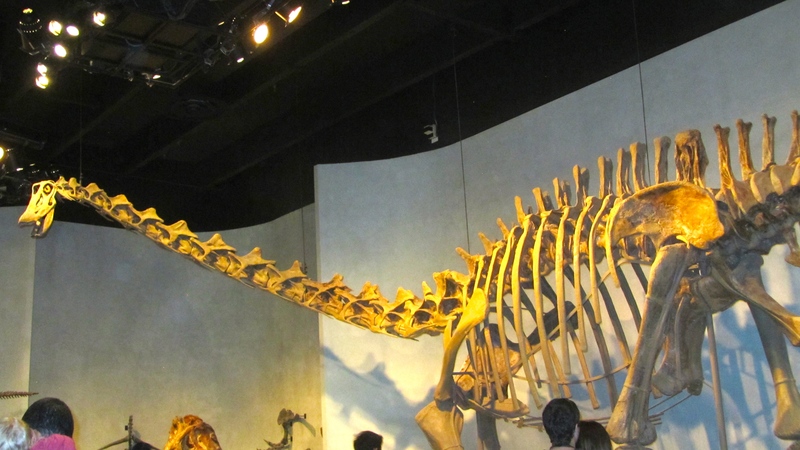 This long necked dinosaur is about 150 million years old. 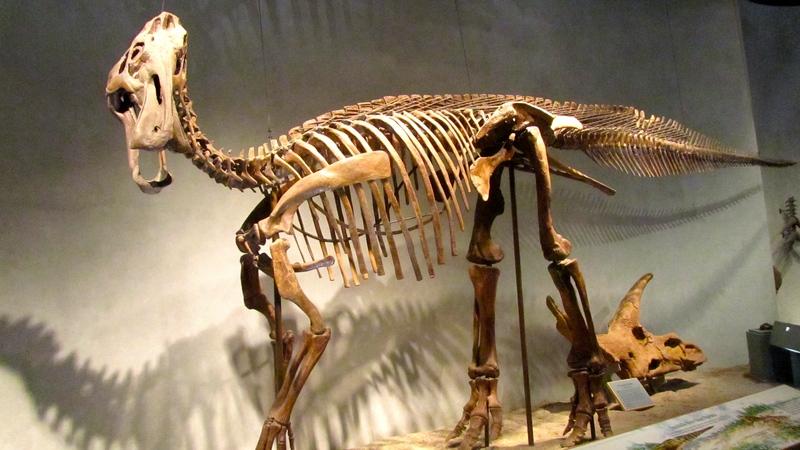 The duckbilled dinosaur, or Hadrosaur, is impressive also. 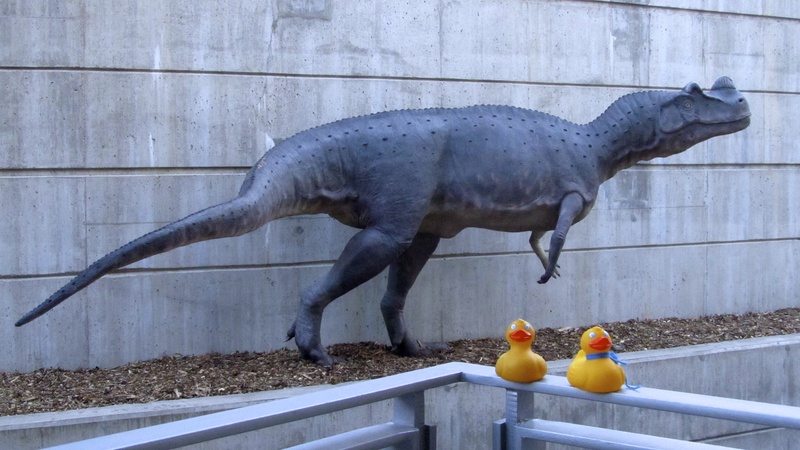 Duckbilled dinosaur has a toothless beak, but behind that beak each duckbilled had tightly packed teeth, as many as 1,000 at a time. When one tooth wore out, another replaced it. No dentures for dinosaurs. 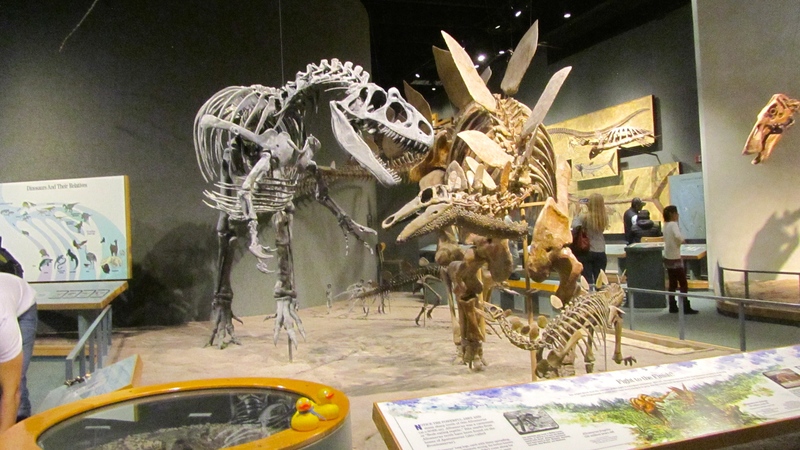 We saw lots of dinosaur exhibits. You will want to see these. 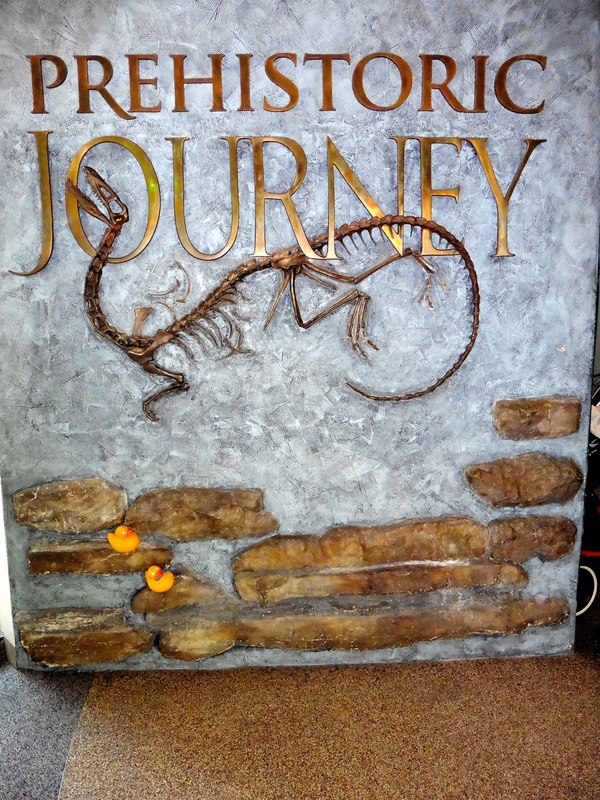 The name of this exhibit is Prehistoric Journey, so there are more than dinosaurs here. 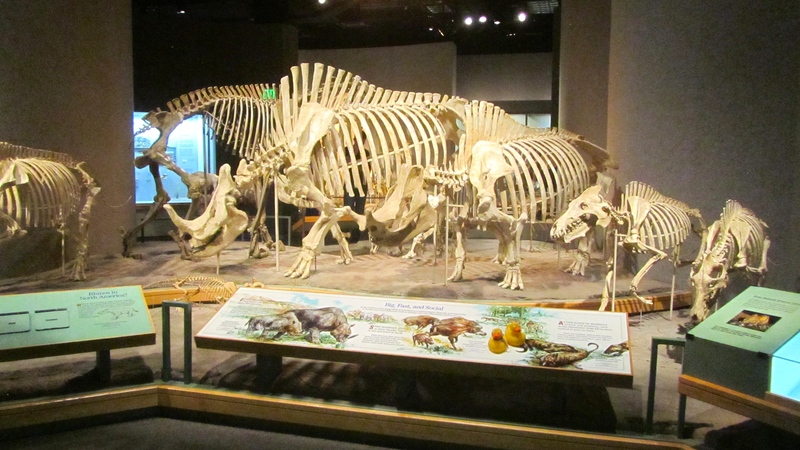 Look at what lived in the Nebraska woodland about 20 million years ago. He lived in Nebraska about 20 million years ago. This “Big Pig” looms menacingly as it catches sight and scent of prey. 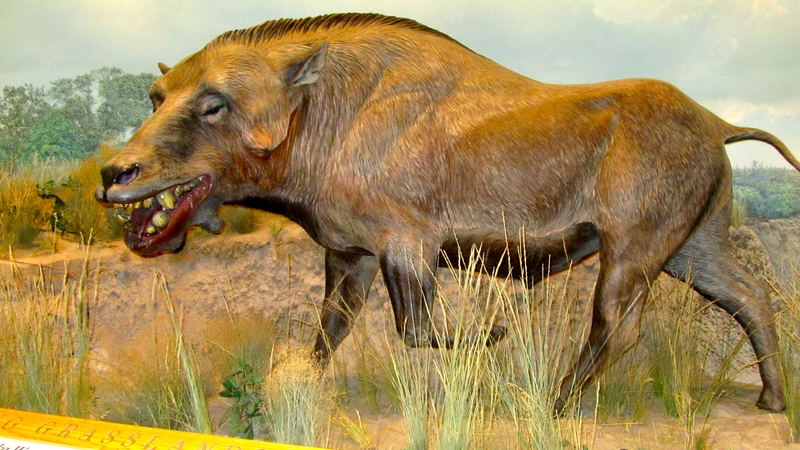 This big pig was both a predator and a scavenger. These pigs lived and traveled in herds. 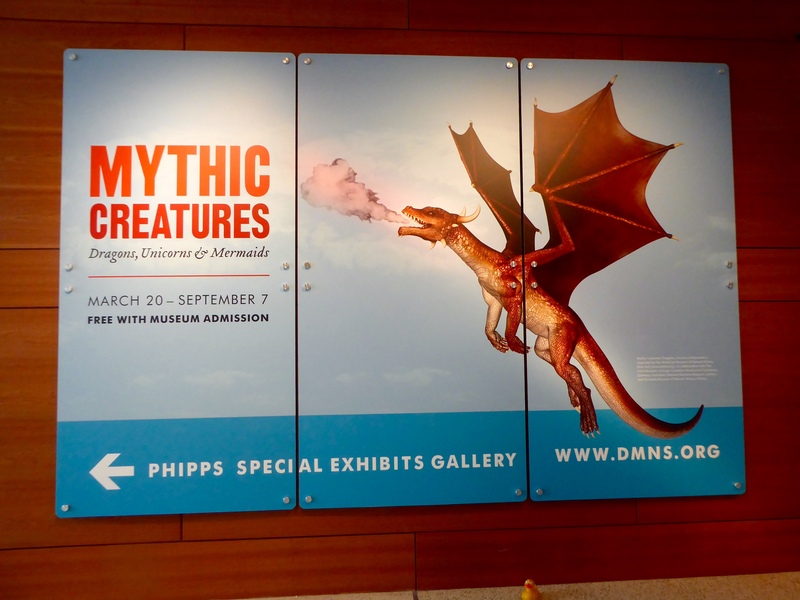 We liked this exhibit and we like dinosaurs. But we are little ducks and we are very happy that these big animals are not walking around here today. 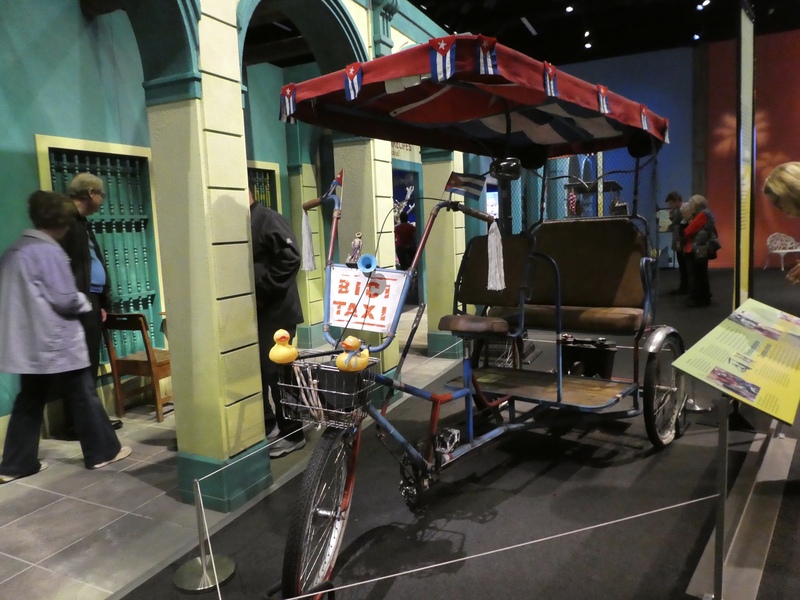 We hope you visit our museum or a museum near you. 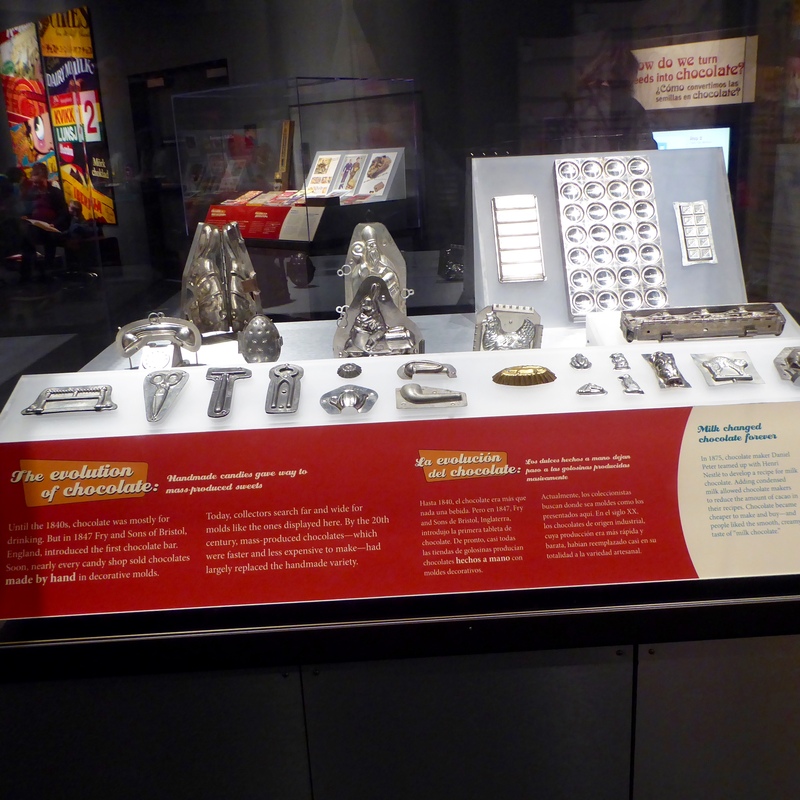 Museums have so many fascinating things to see and you can learn so much there. You will love all the dinosaurs. Mummies??? 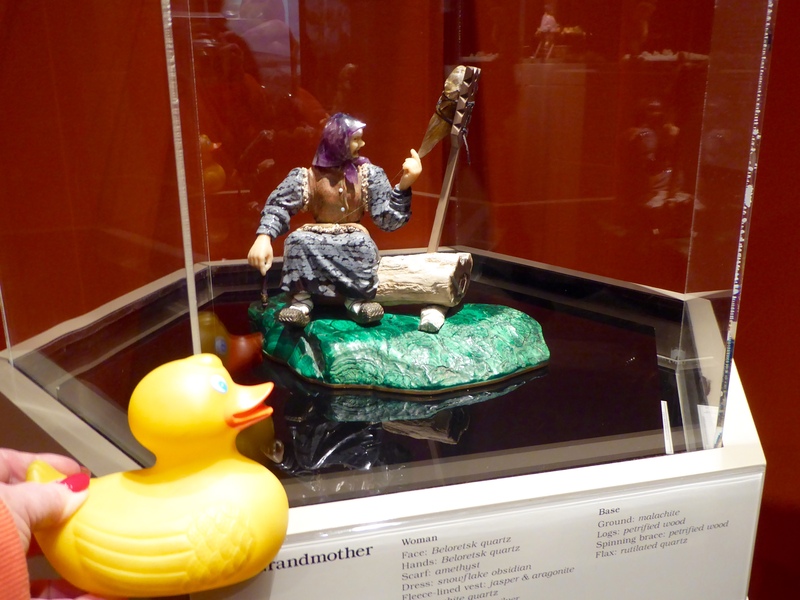 I, Zeb the Duck, and Soapy Smith Duck, saw mummies–in Denver. 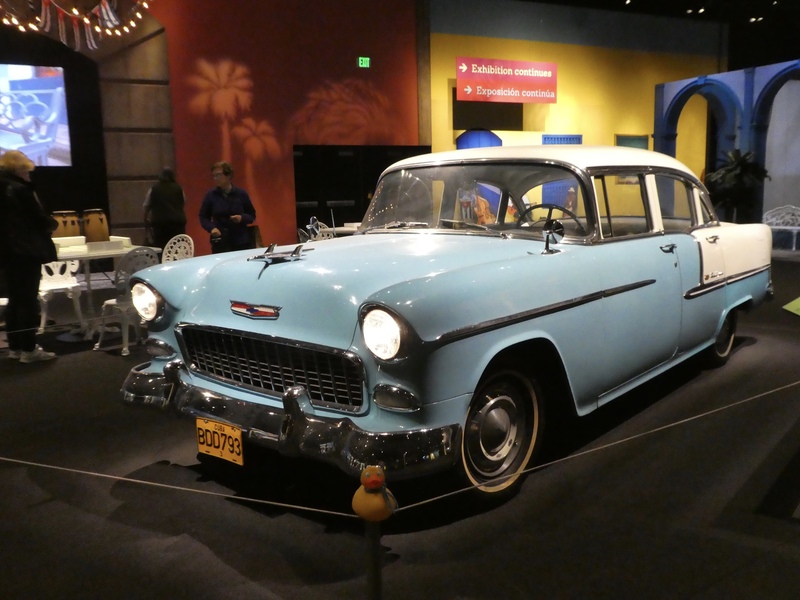 Mom took us to Denver’s Museum of Science and Nature. We saw real mummies from ancient Egypt. Let’s go in the room of mummies. Why did the Egyptians mummify bodies? 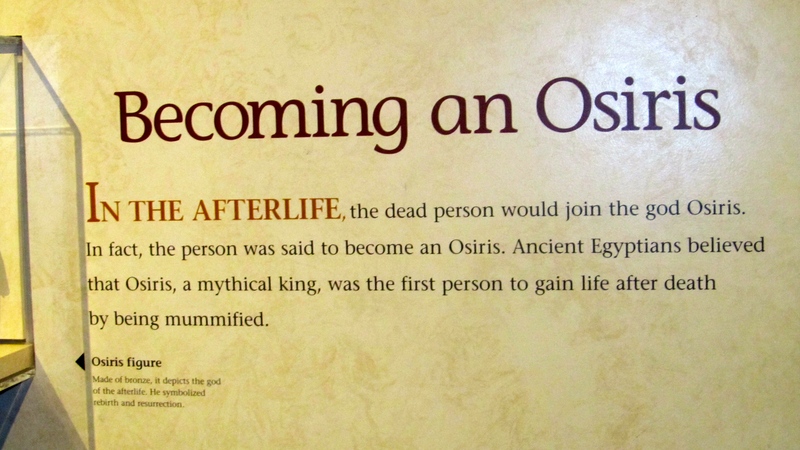 In the afterlife the deceased would join the god Osiris. The person was said to become an Osiris. Here is the mummy of a poor lady. 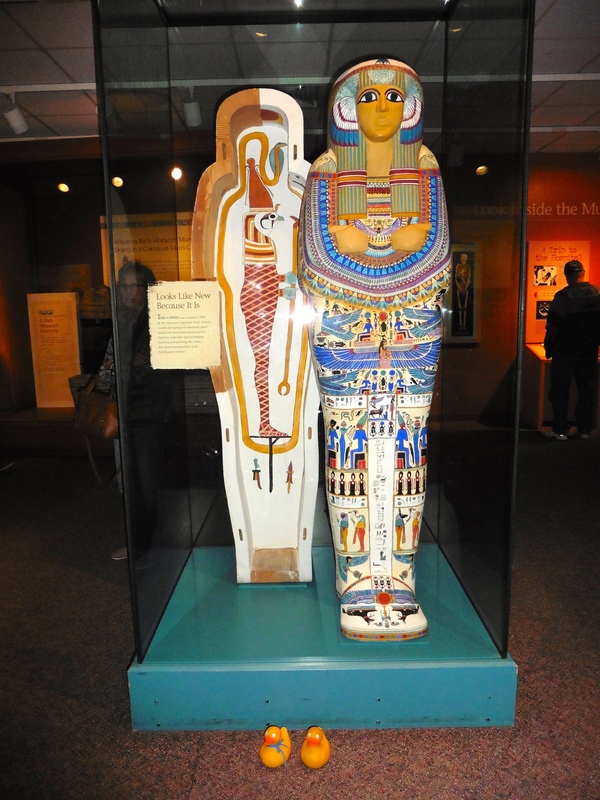 Mummy and coffin of a poor woman. But, how did the Egyptians mummify bodies? In 4 steps. First the internal organs were removed. The priests removed most organs through a cut on the person’s left side. The heart was not removed, as the heart was the site of wisdom and intelligence. The brain was extracted through the nose with long hooks. Second, the body was dried. 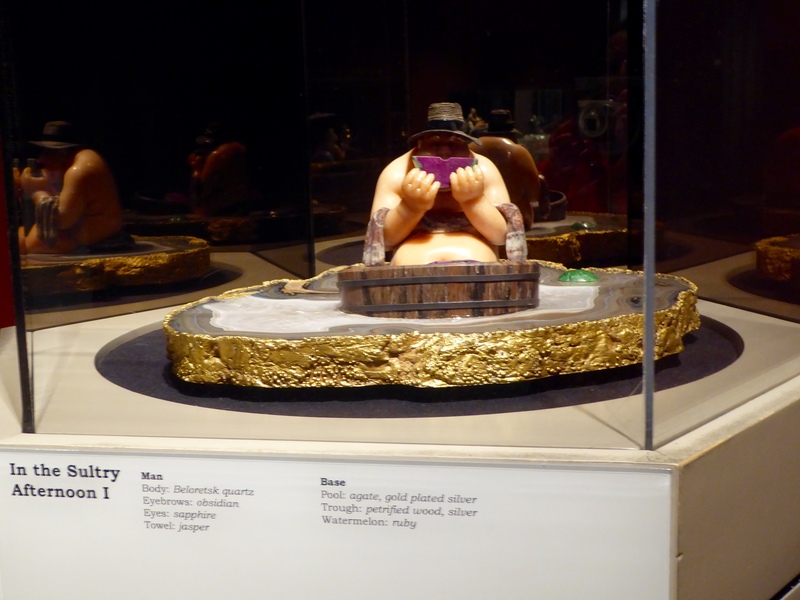 During the mummification process, items that the deceased may need were assembled. Some of things needed for the journey to the afterlife. 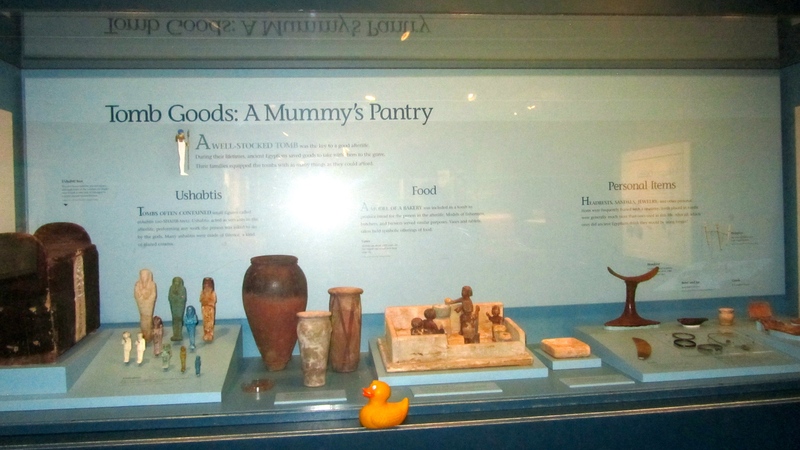 These items were to comfort him and help in his journey to the afterlife. The body was laid on a bed of natron, a natural salt, during the drying stage. The body was dried for 40 days. Third, the body was wrapped in linen provided by the family. The quality and quantity of the linen varied by the wealth of the family. Amulets and scarabs were often put in the linen. 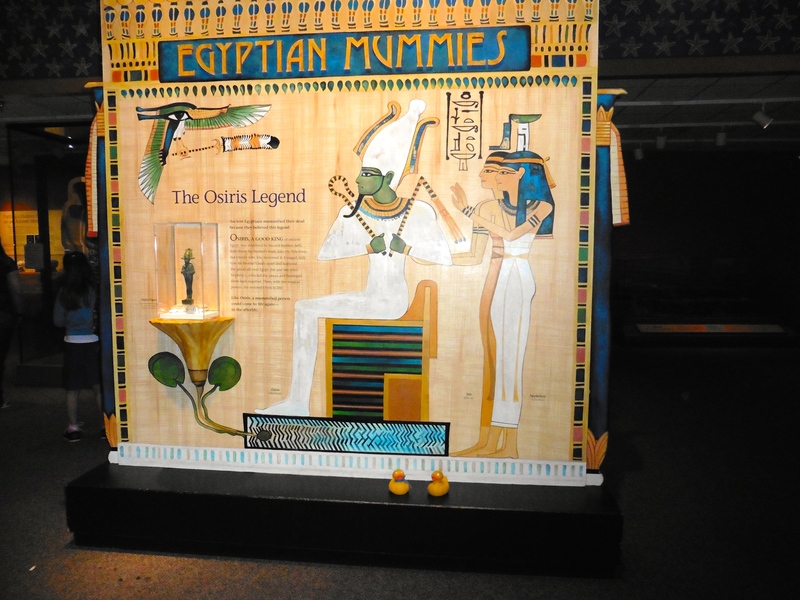 Fourth, the mummy was placed in the coffin and was ready for a proper funeral and burial. This mummification process took 70 days. 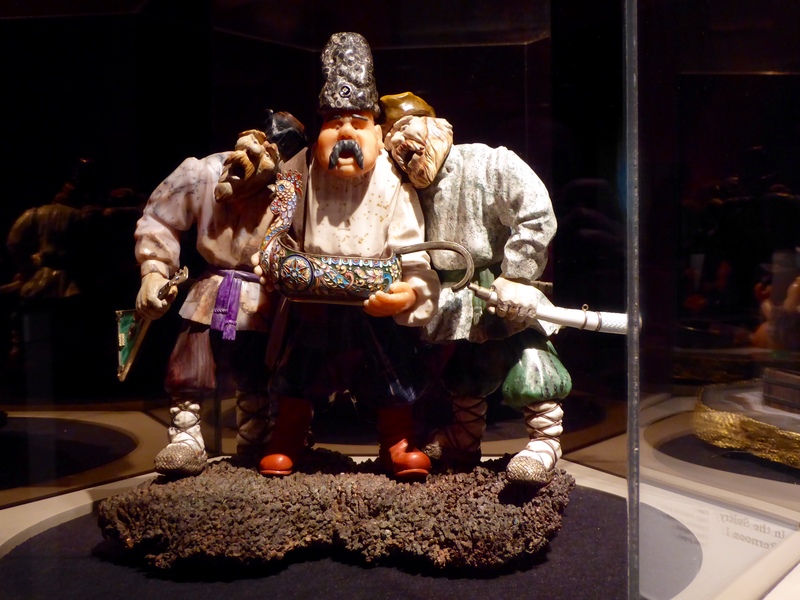 Until 1946 tourists to Egypt could buy mummies as souvenirs of their trip. 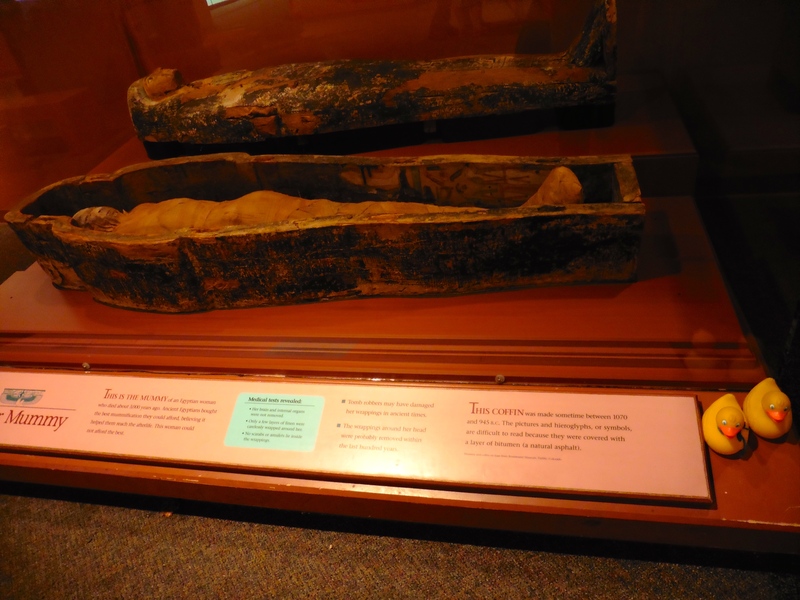 In 1904 a businessman from Pueblo, Colorado purchased these mummies. 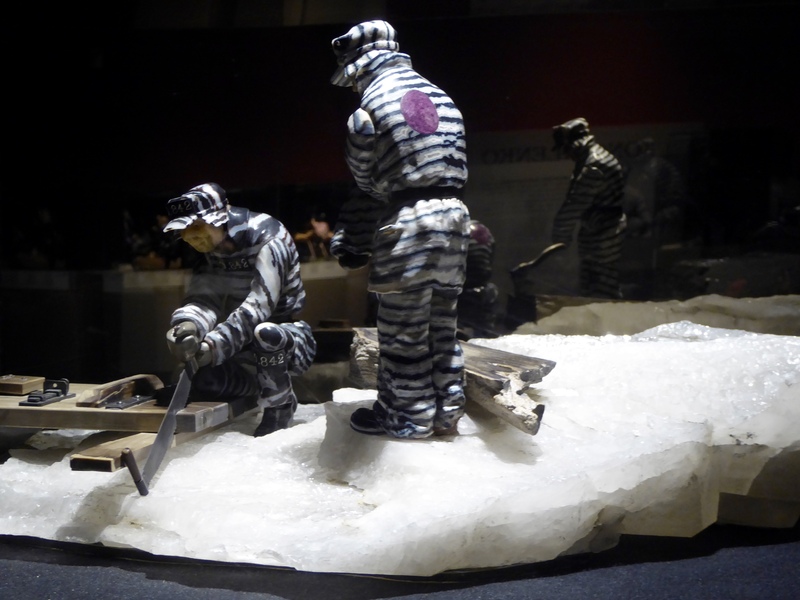 They are in Denver on loan from Pueblo’s Rosemount Museum. The hieroglyphs with this coffin lid say this man was a scribe at the temple of the god Amun in the city of Thebes. 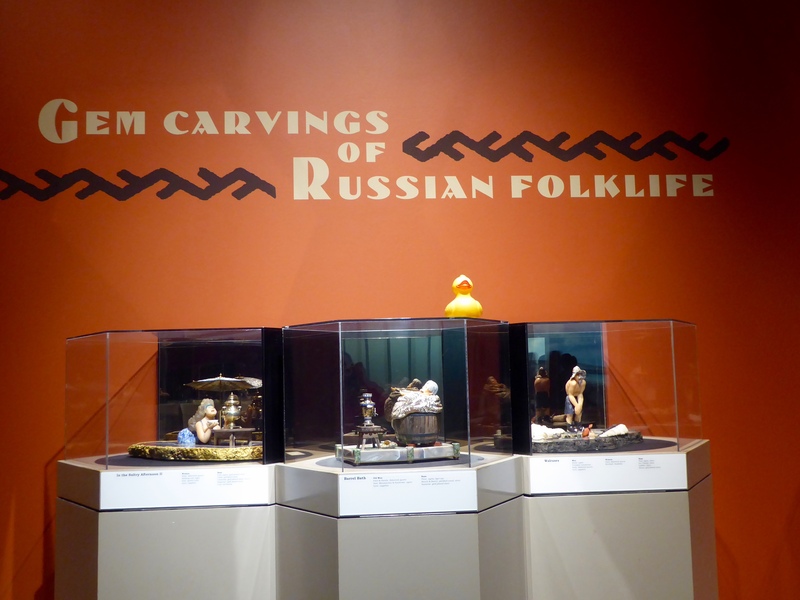 The high quality of the carpentry and paintings indicate he was a respected and wealthy man. The paintings have been well preserved for the past 3,000 years, but some parts of the lid have fallen off. What did these people look like when they were alive? How they may have looked when alive. 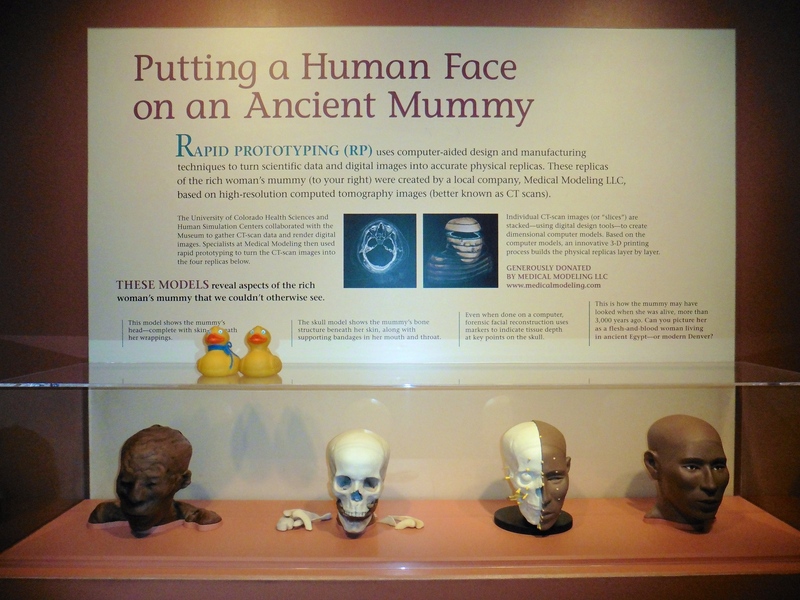 From the skulls, this is how the scientists believe they looked. 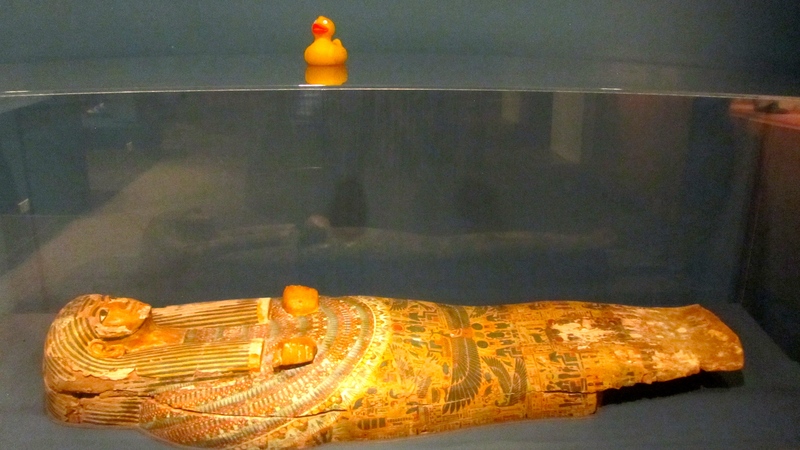 These mummies are fascinating, but we ducks don’t think we want to be mummies. 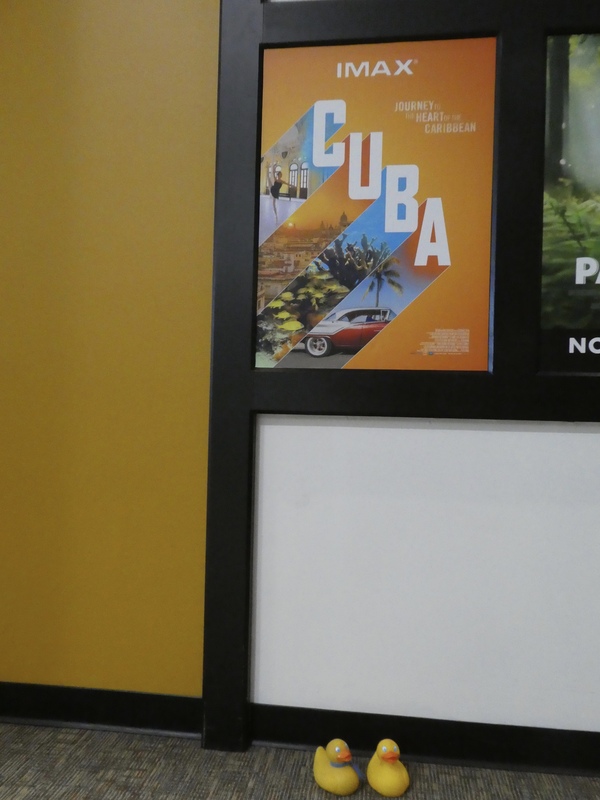 You would like to see this exhibit. 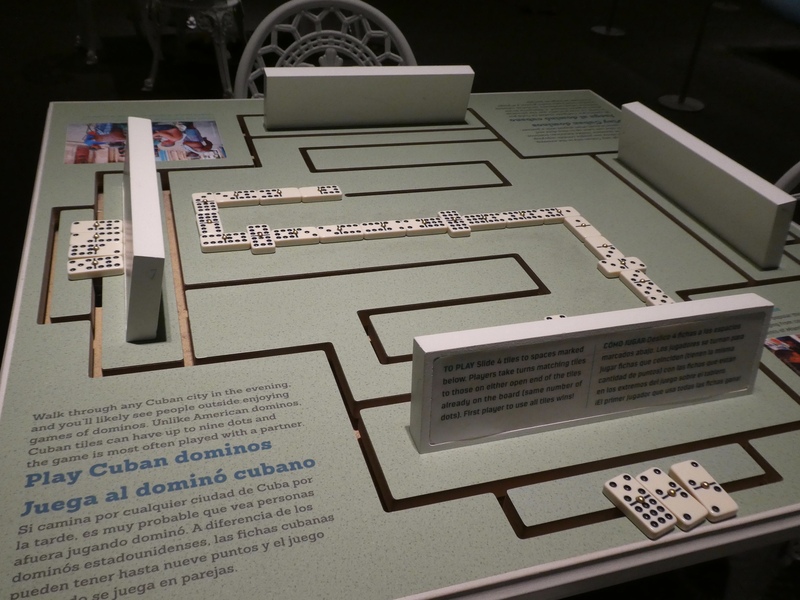 If you don’t live near Denver, visit an exhibit near you. 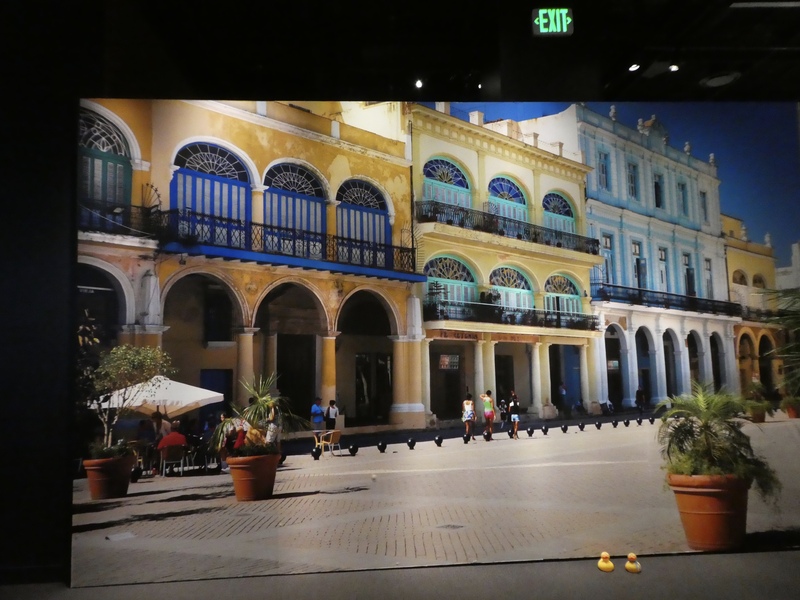 It is fun to be a tourist in your own town. We hope you try it soon and often.